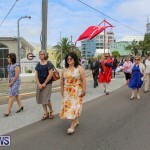 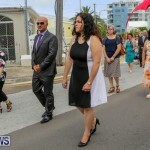 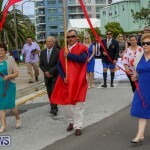 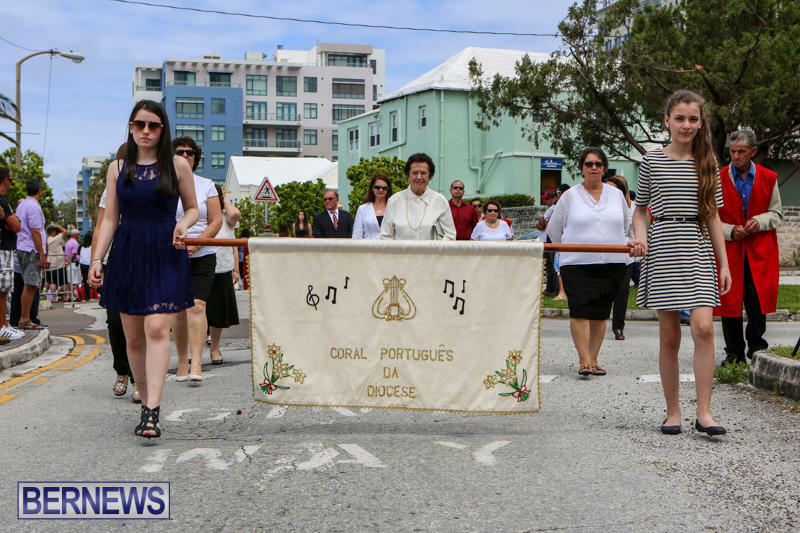 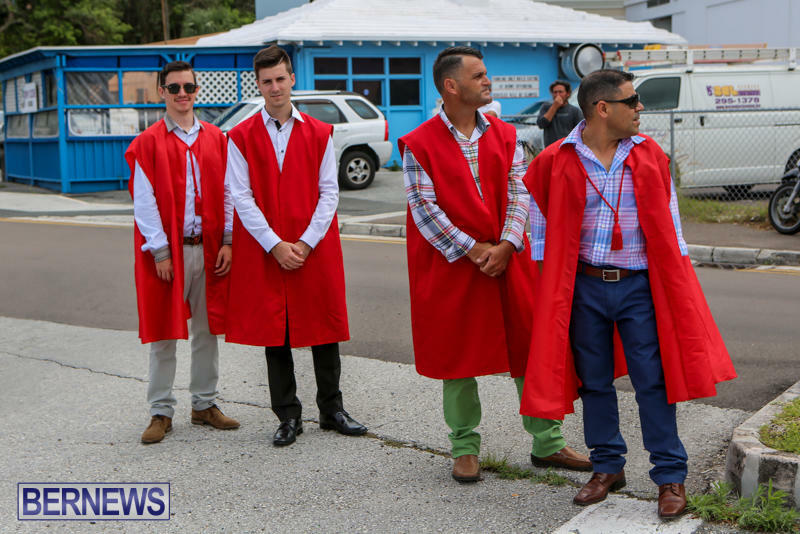 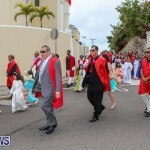 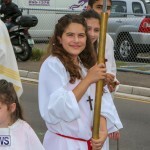 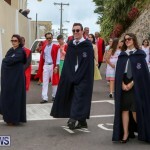 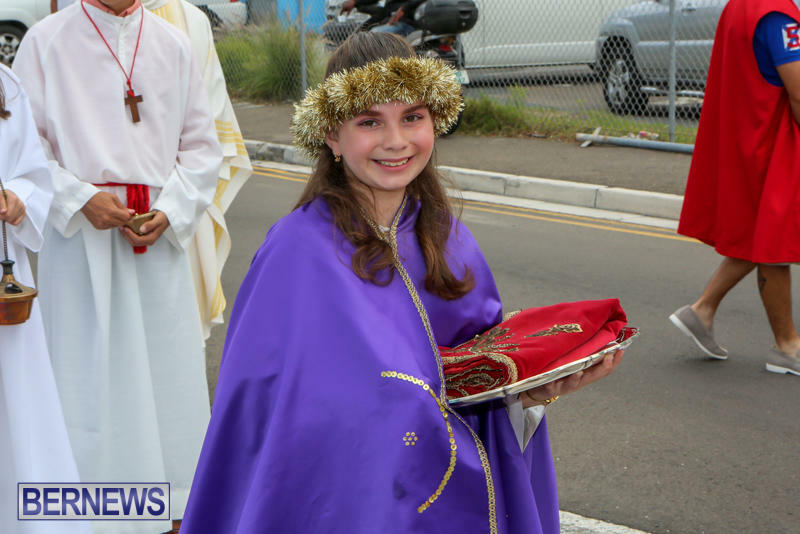 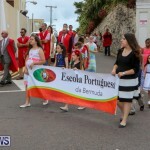 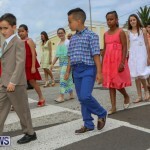 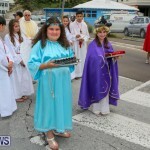 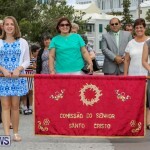 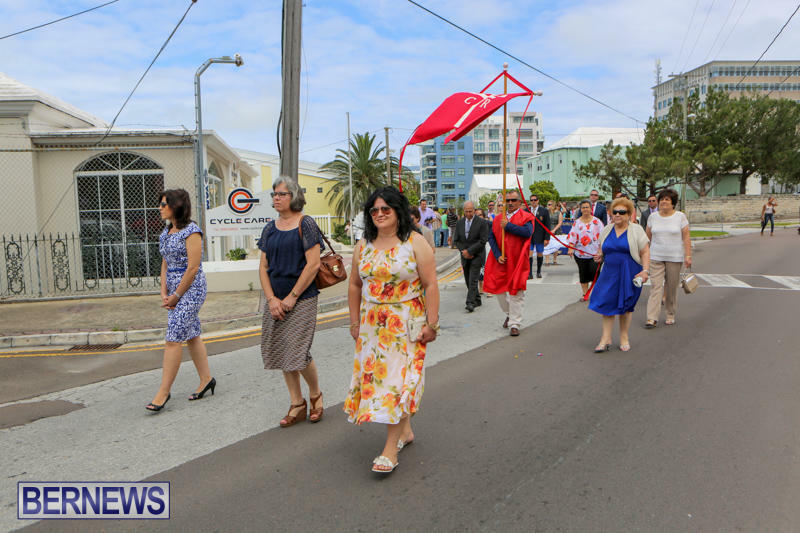 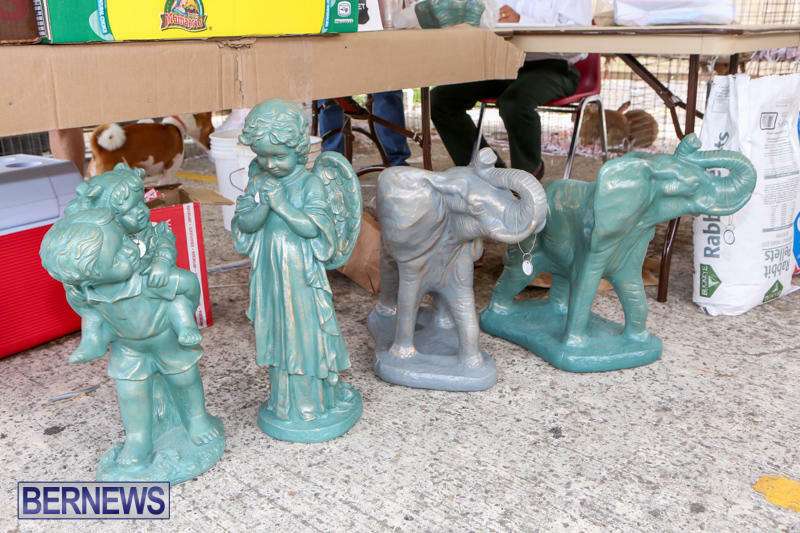 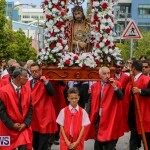 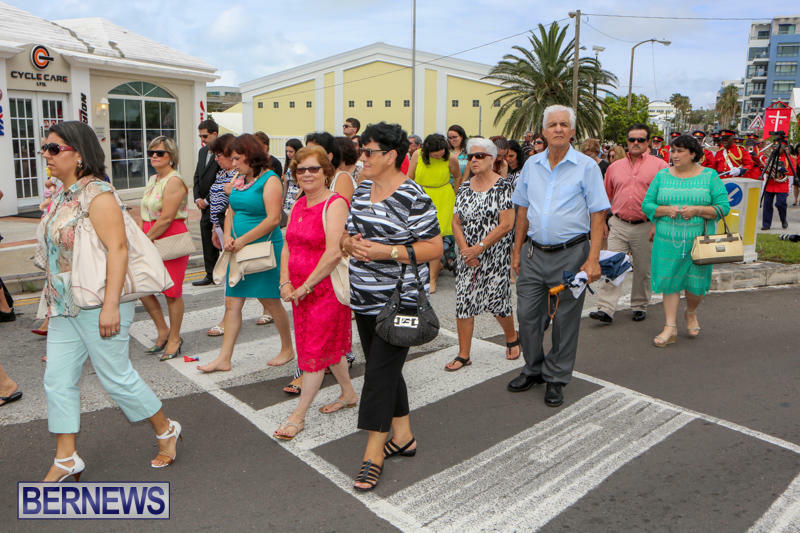 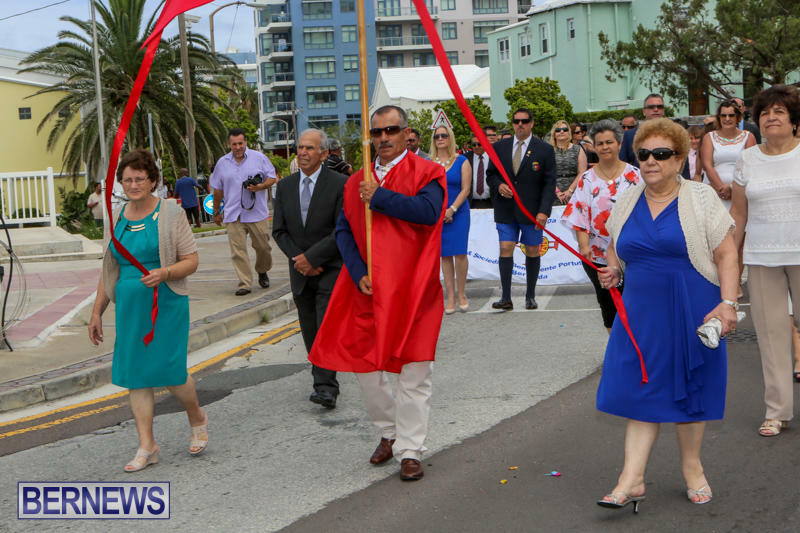 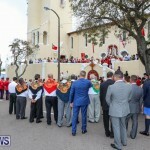 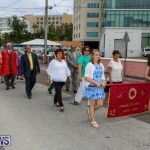 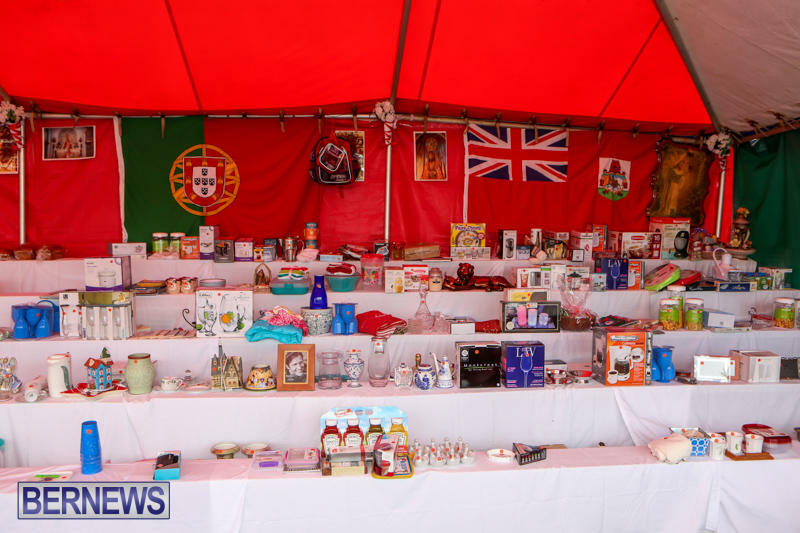 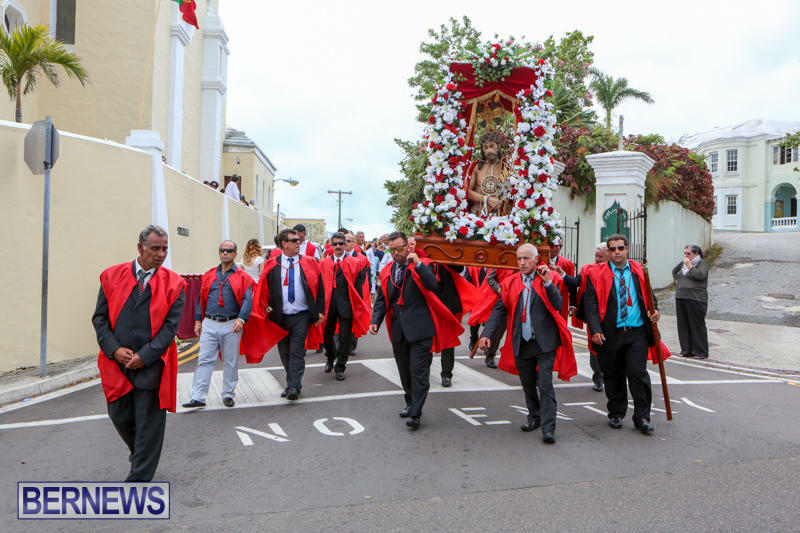 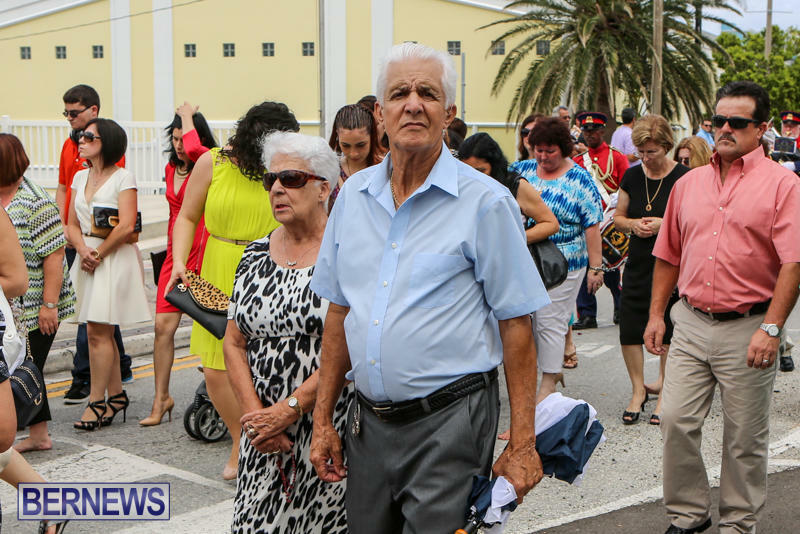 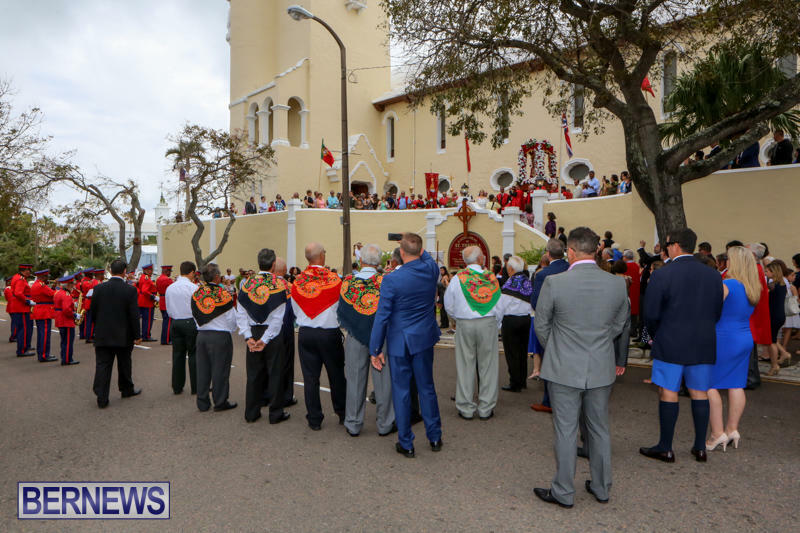 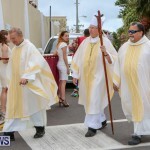 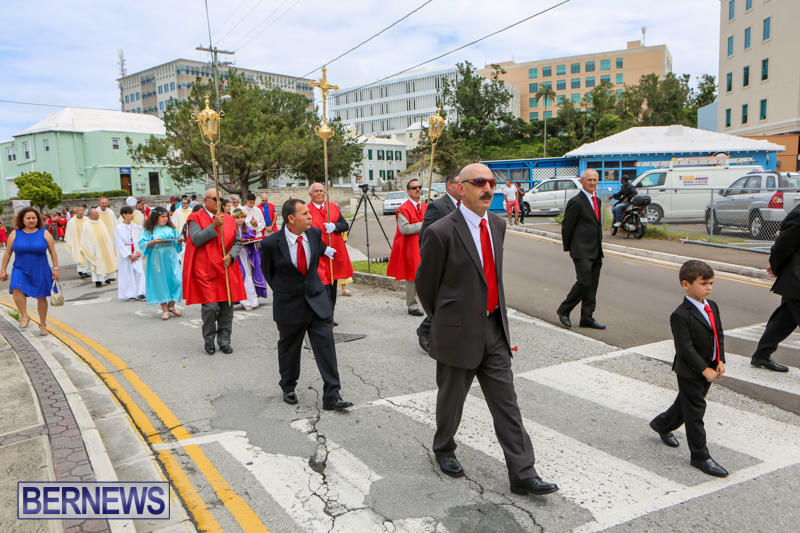 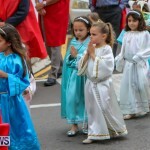 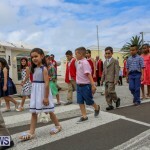 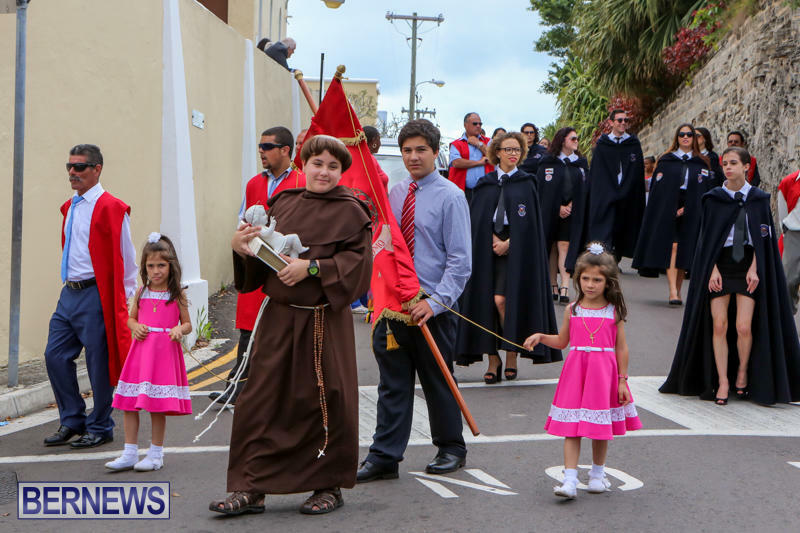 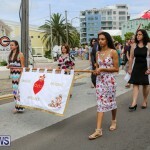 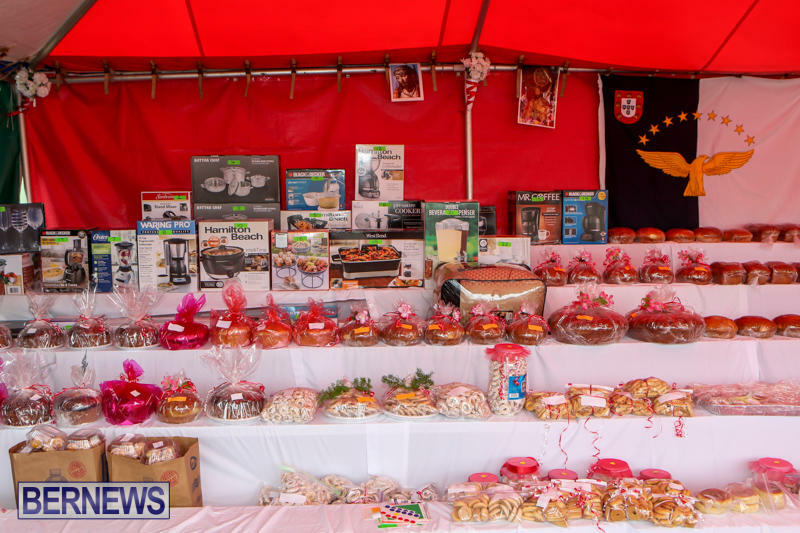 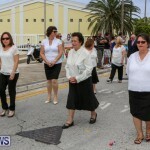 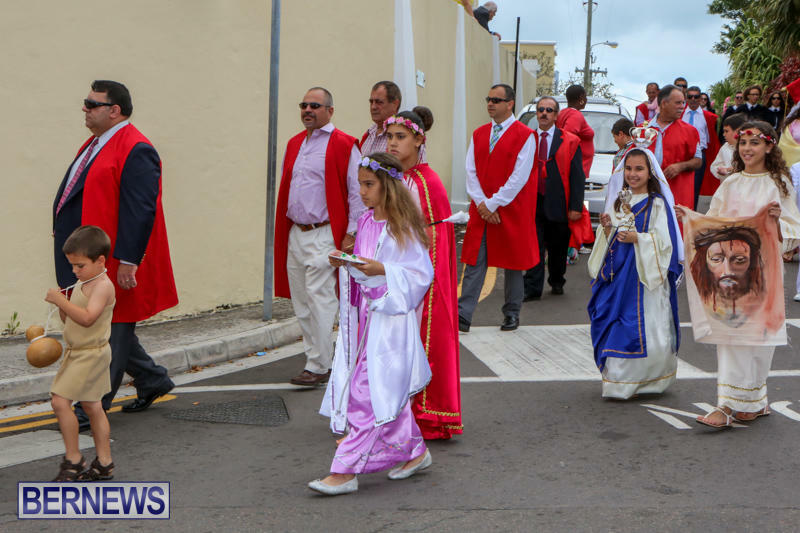 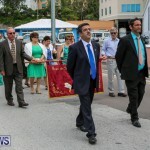 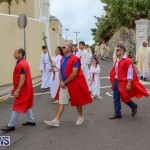 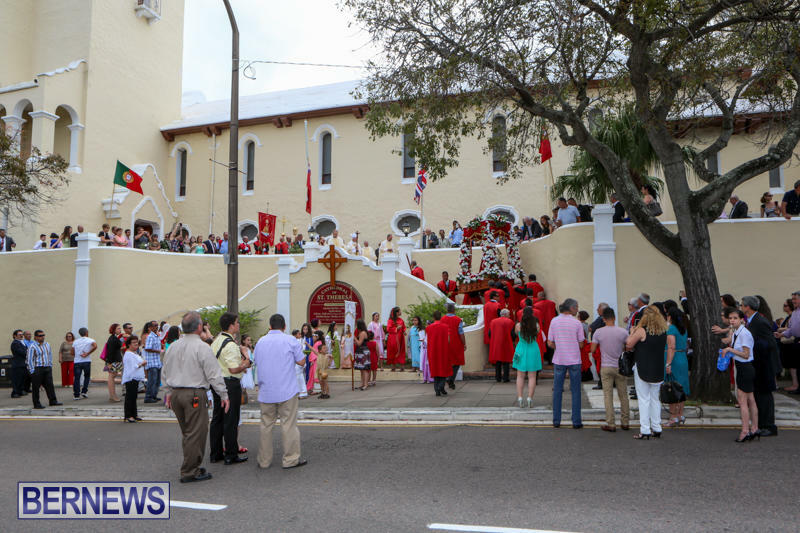 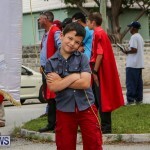 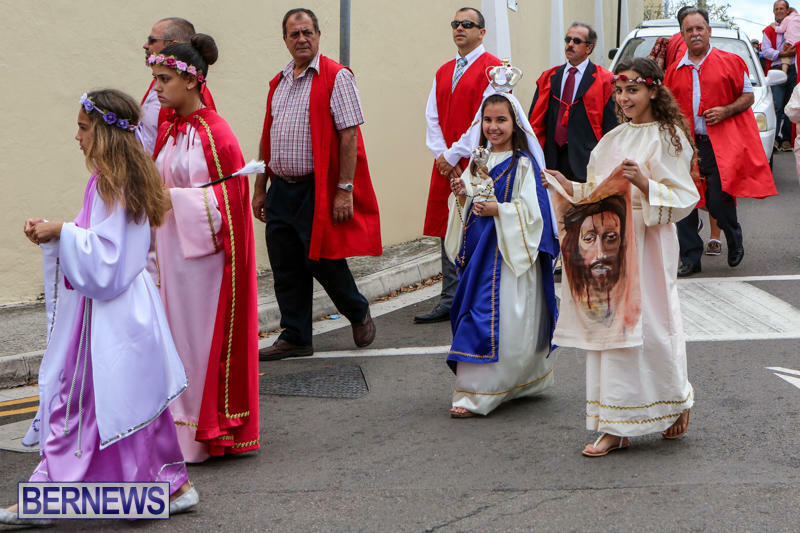 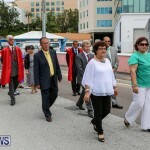 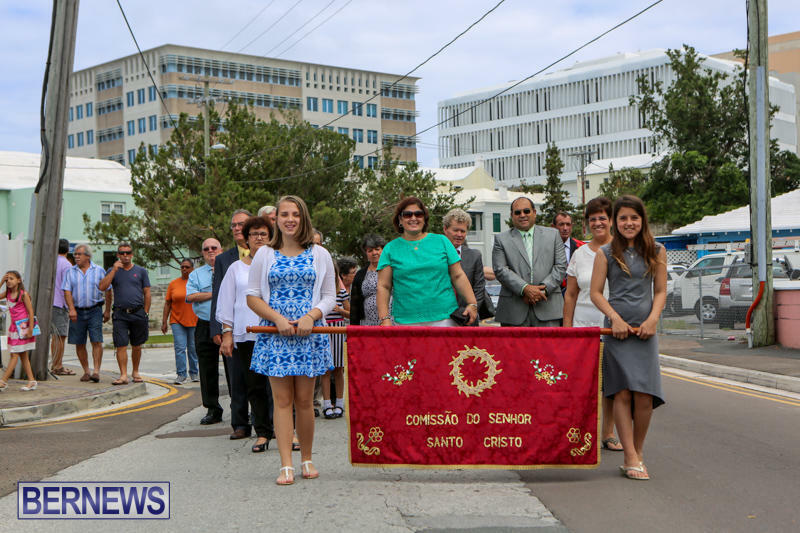 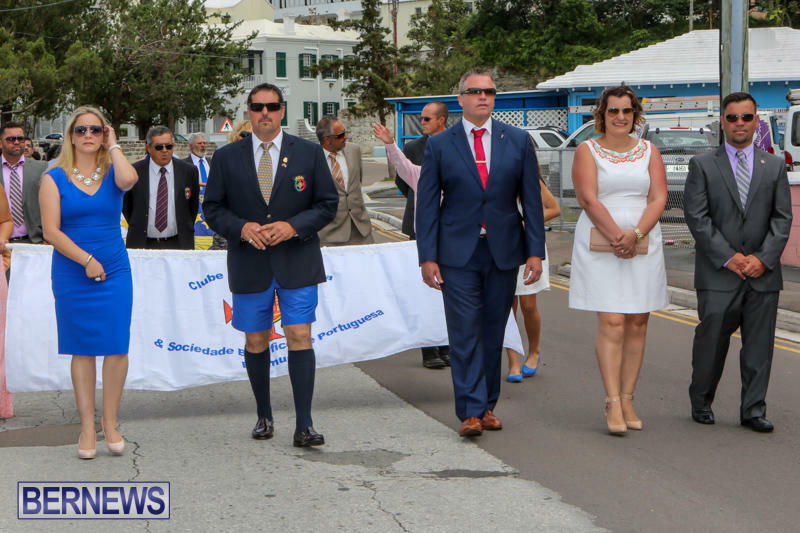 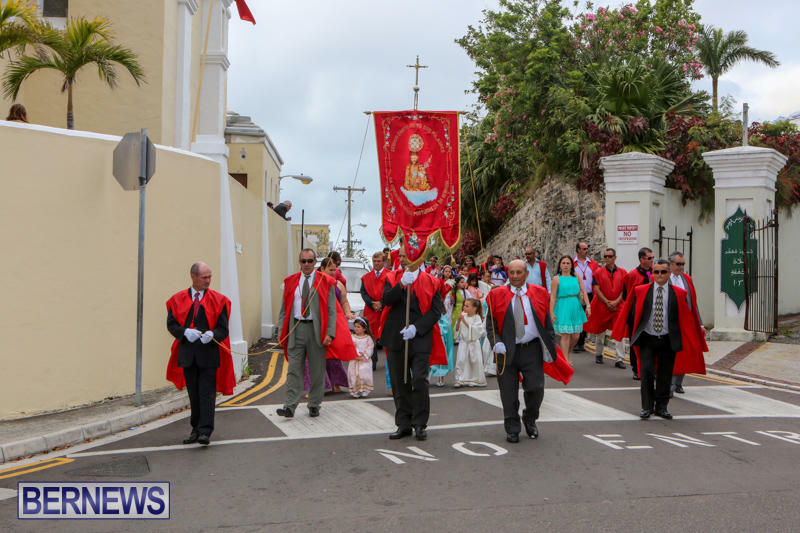 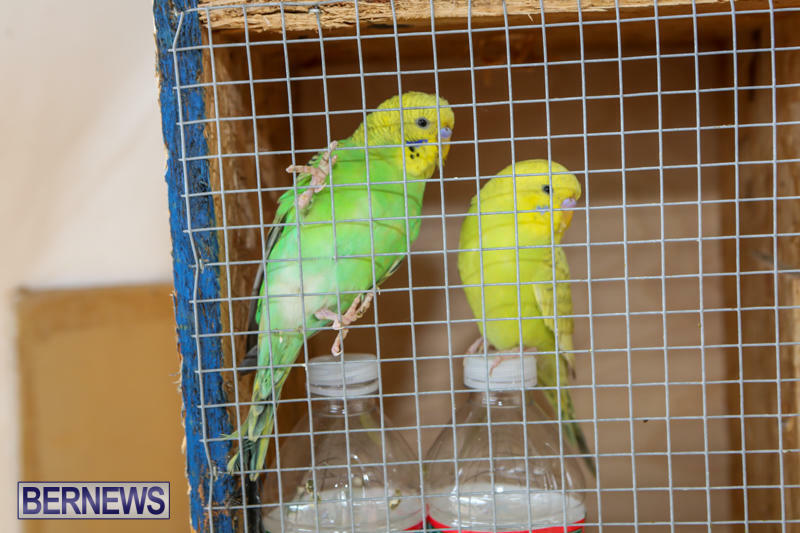 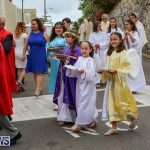 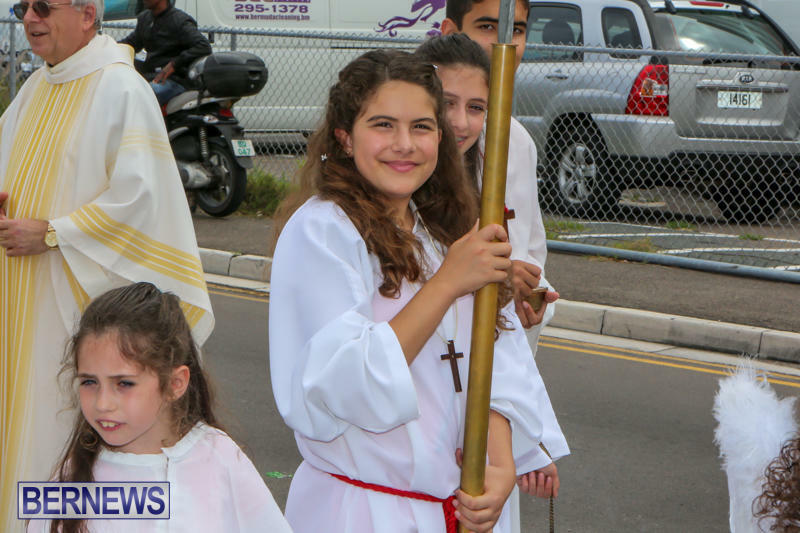 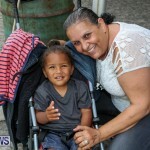 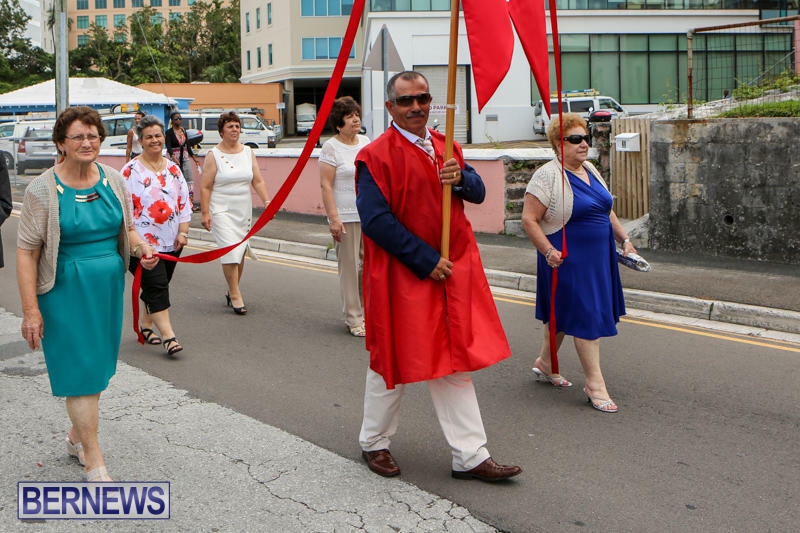 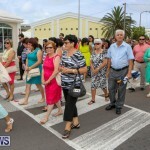 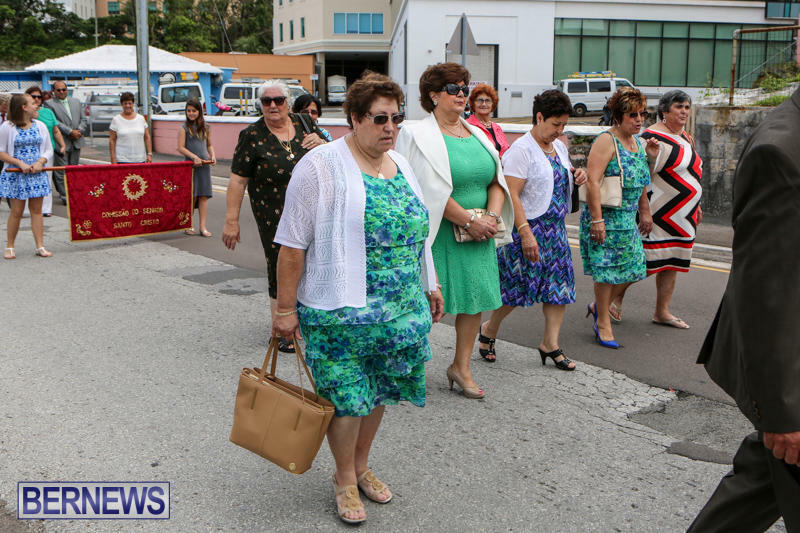 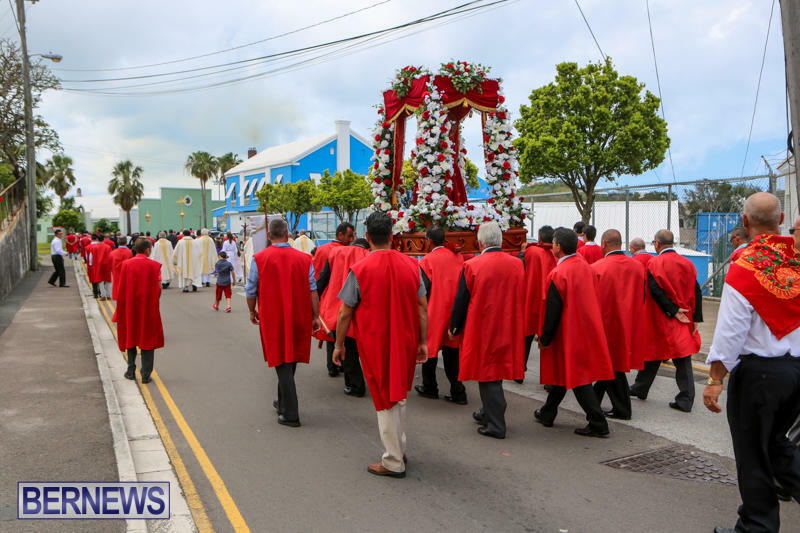 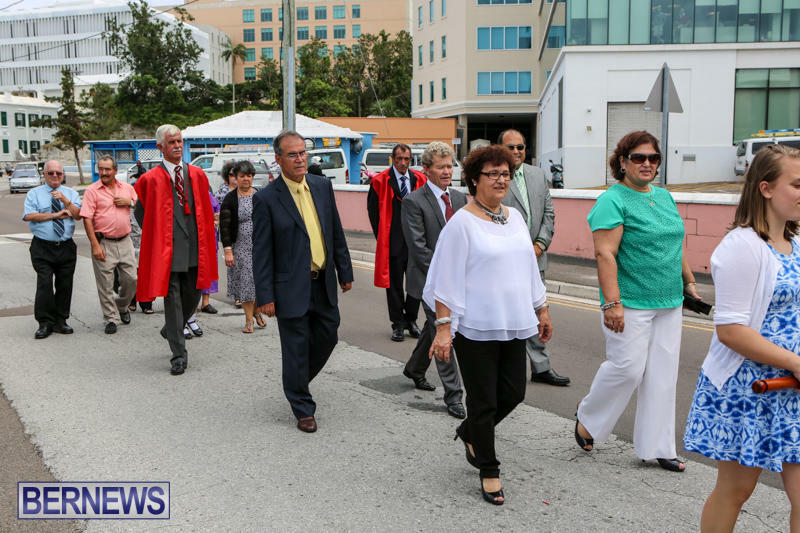 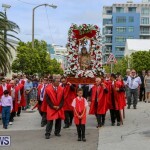 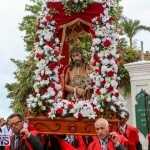 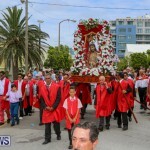 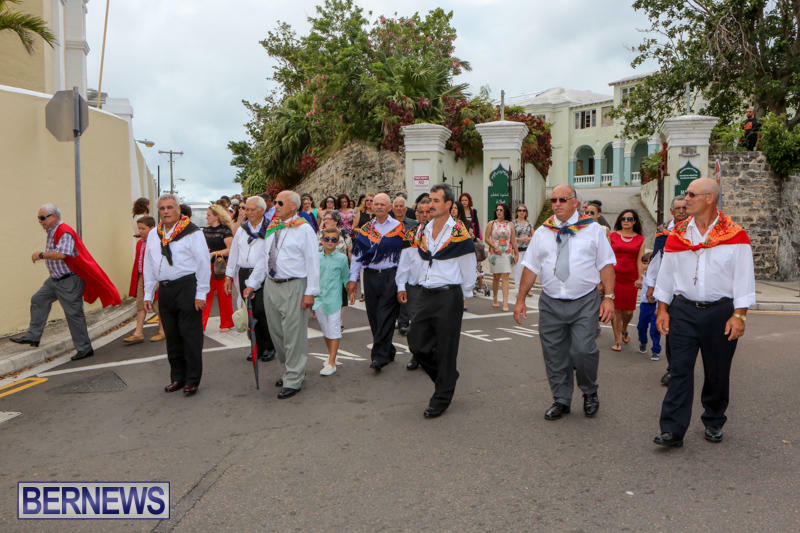 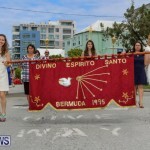 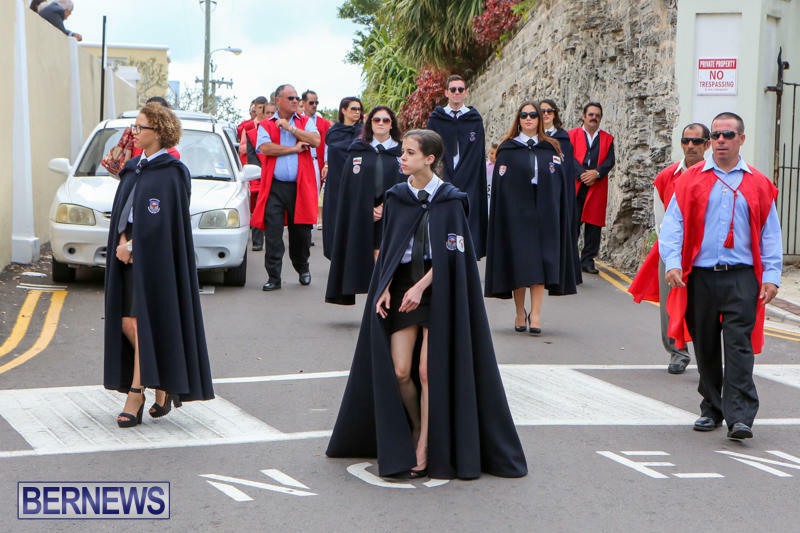 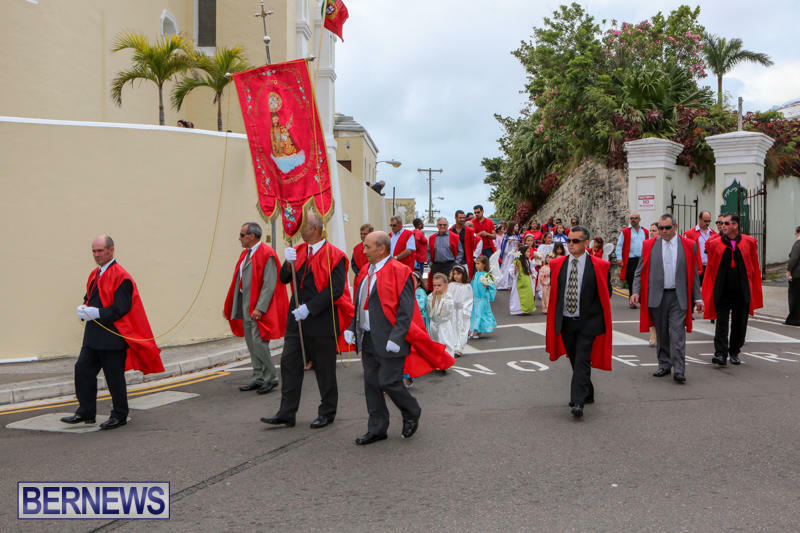 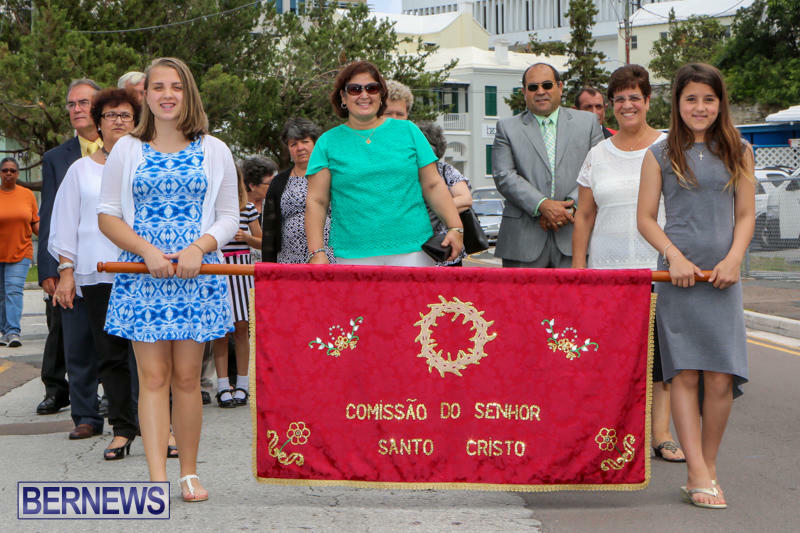 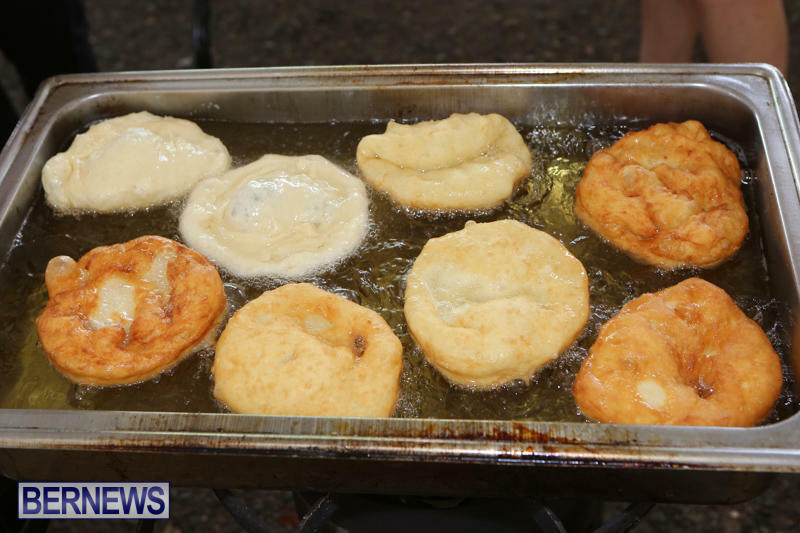 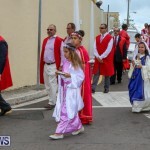 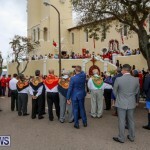 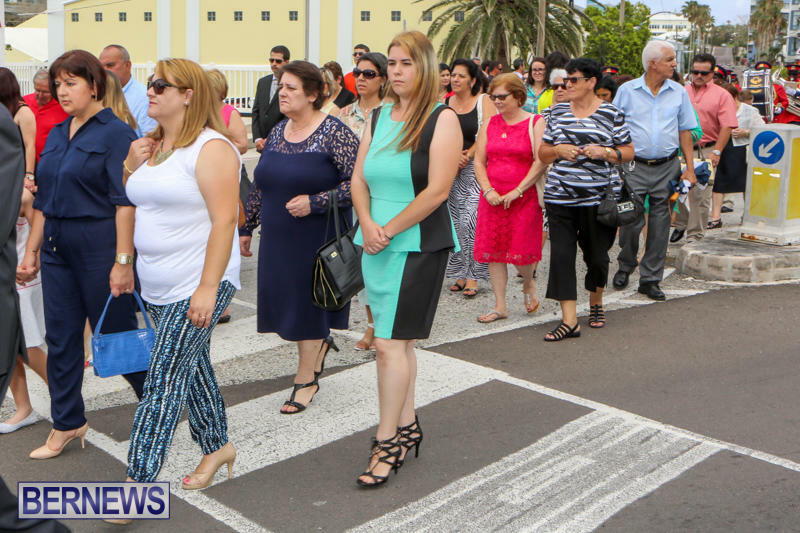 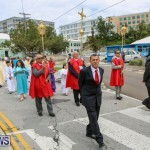 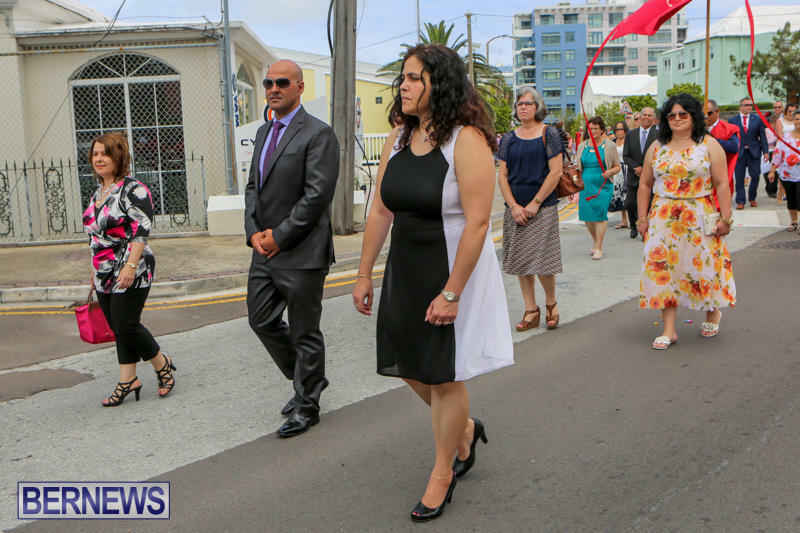 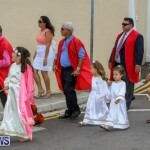 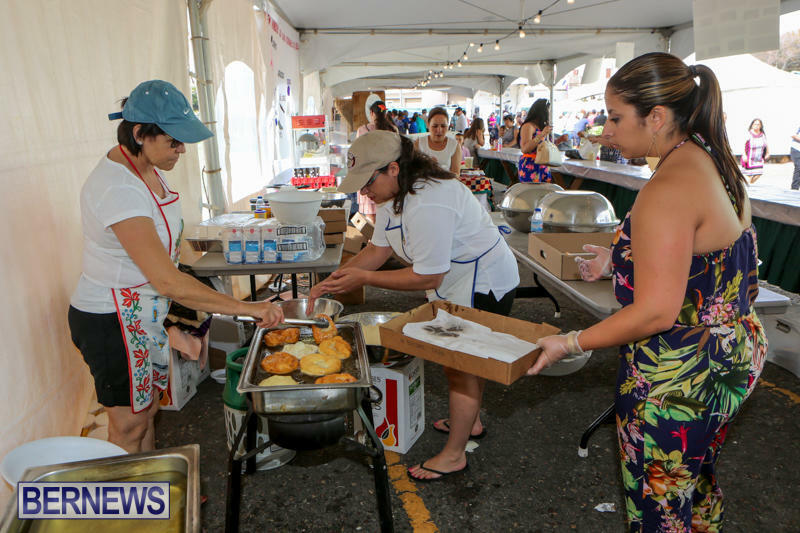 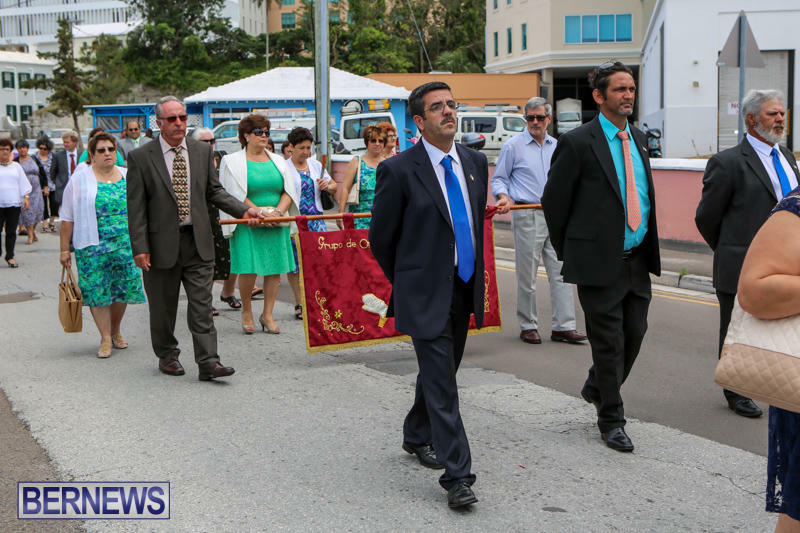 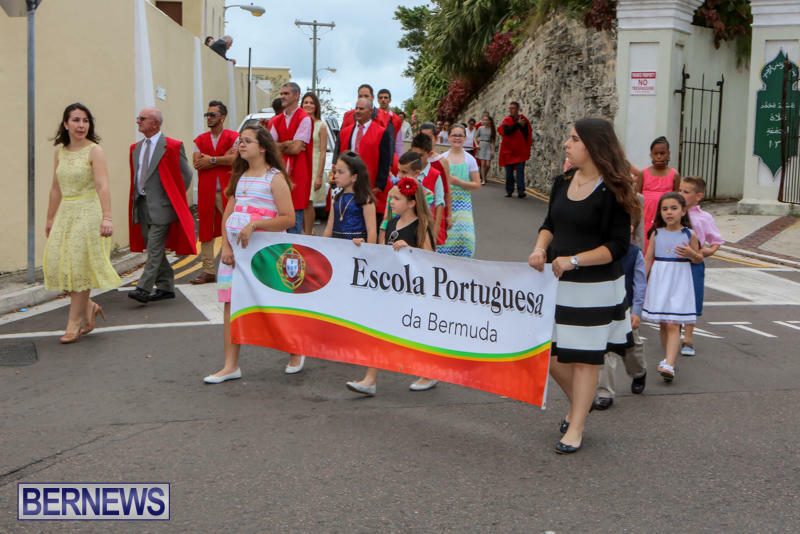 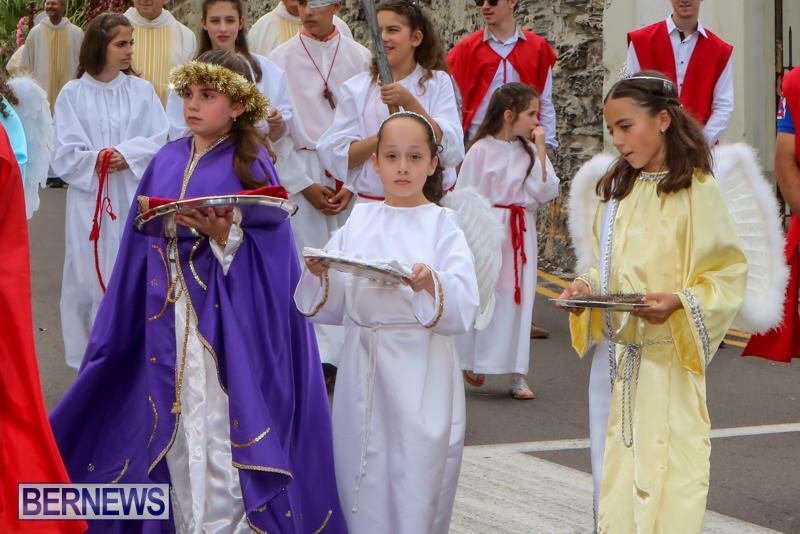 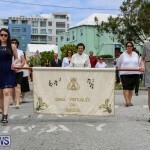 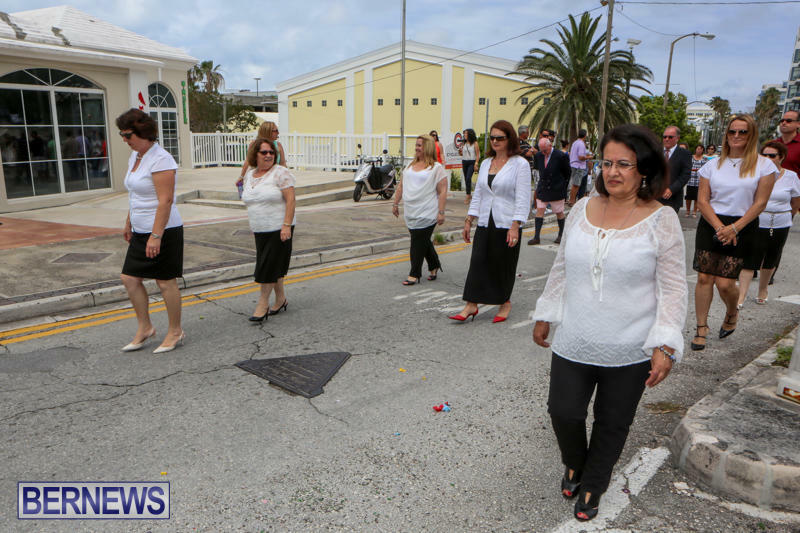 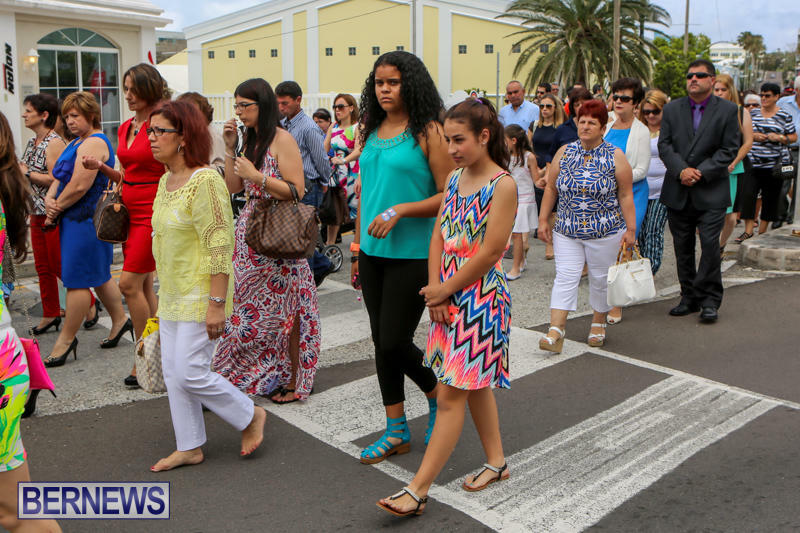 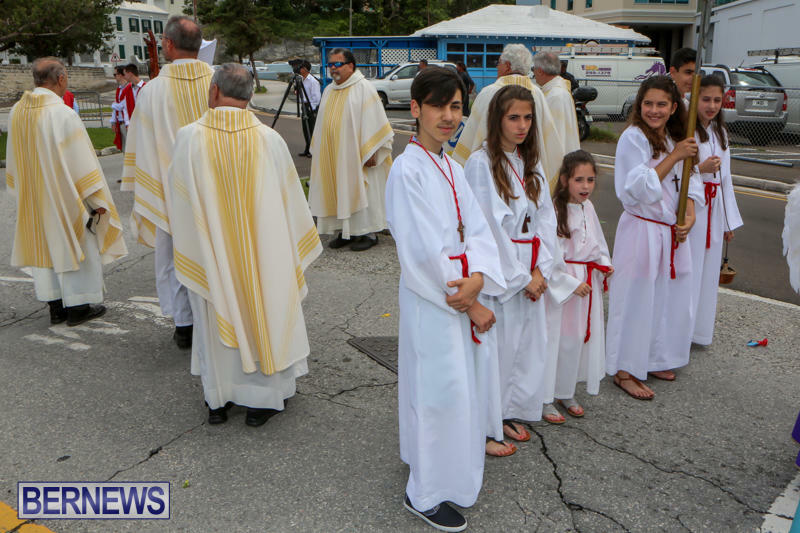 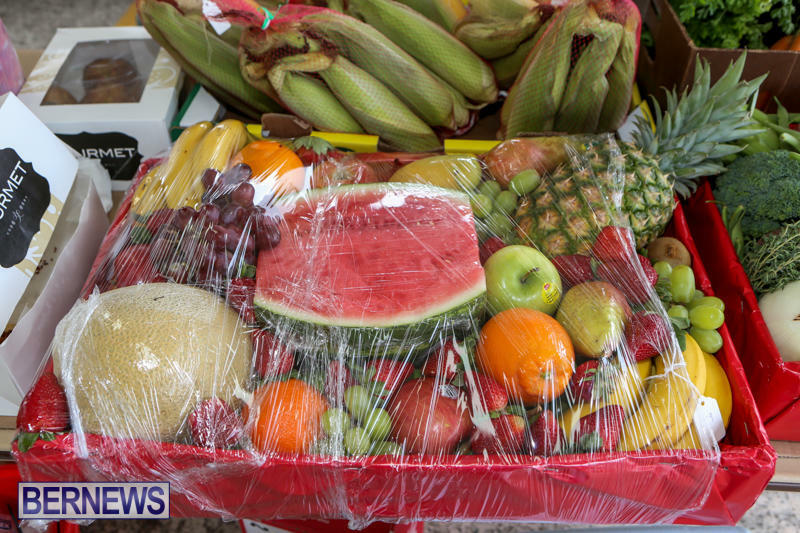 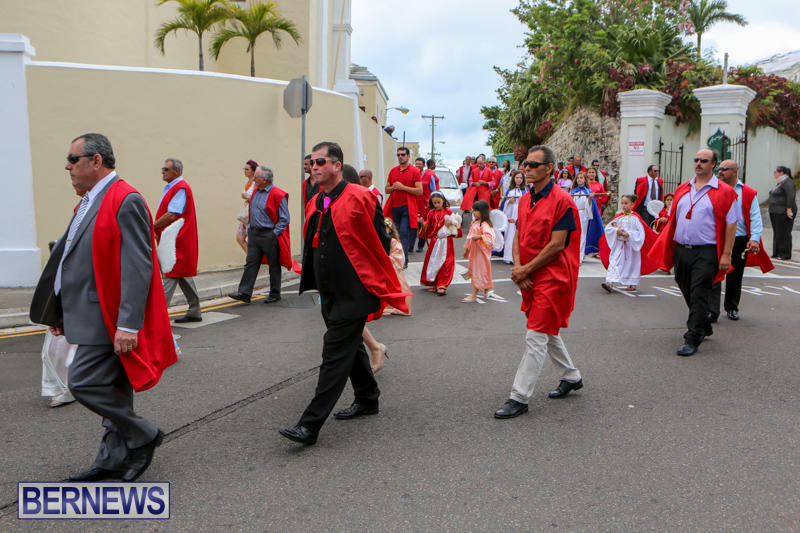 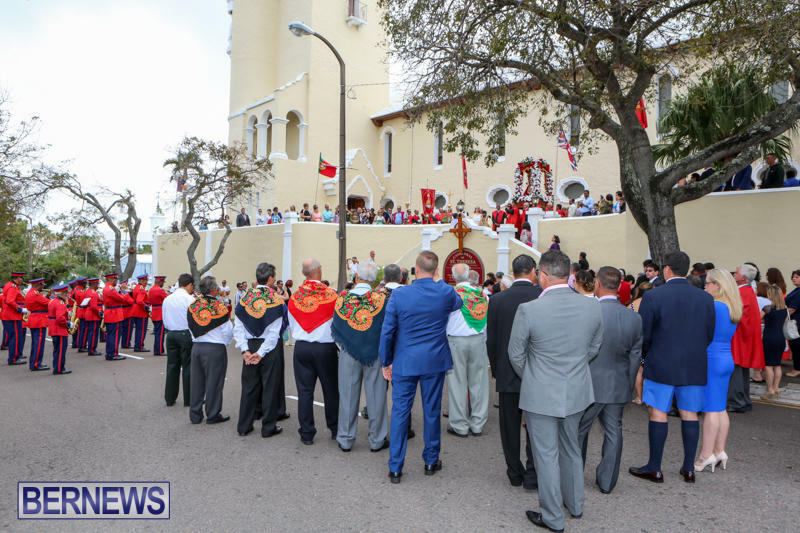 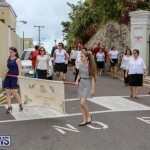 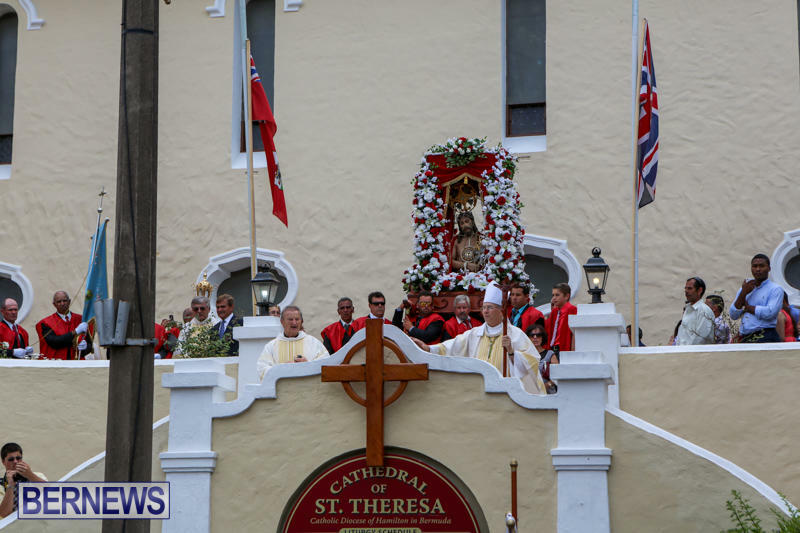 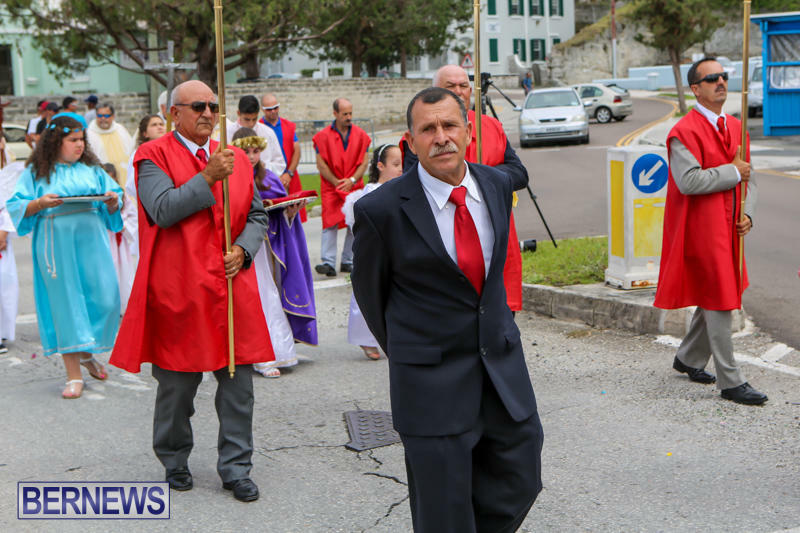 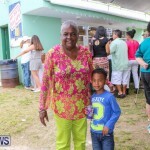 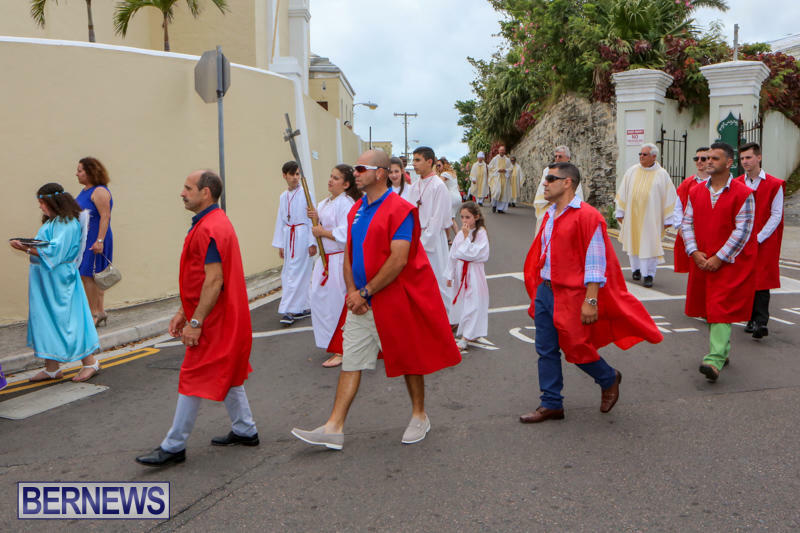 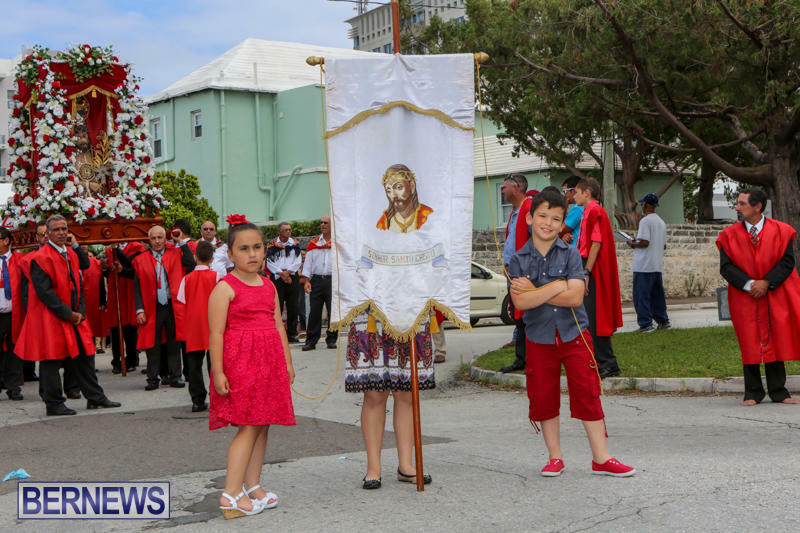 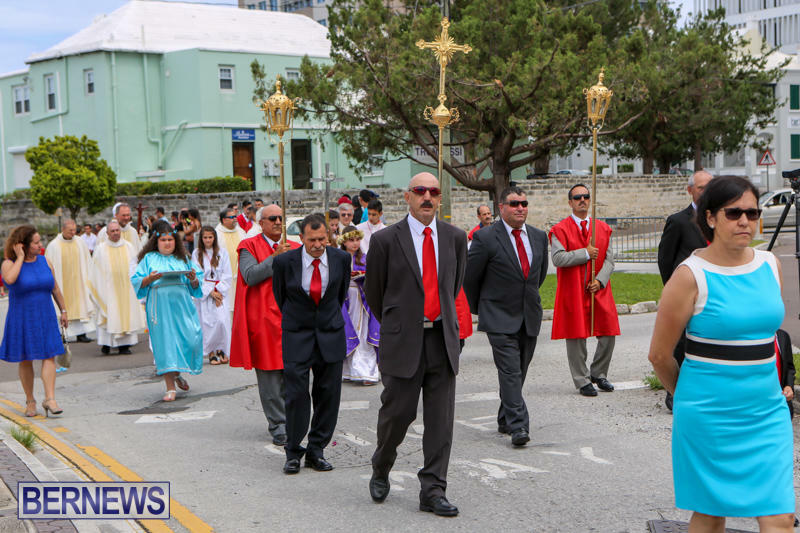 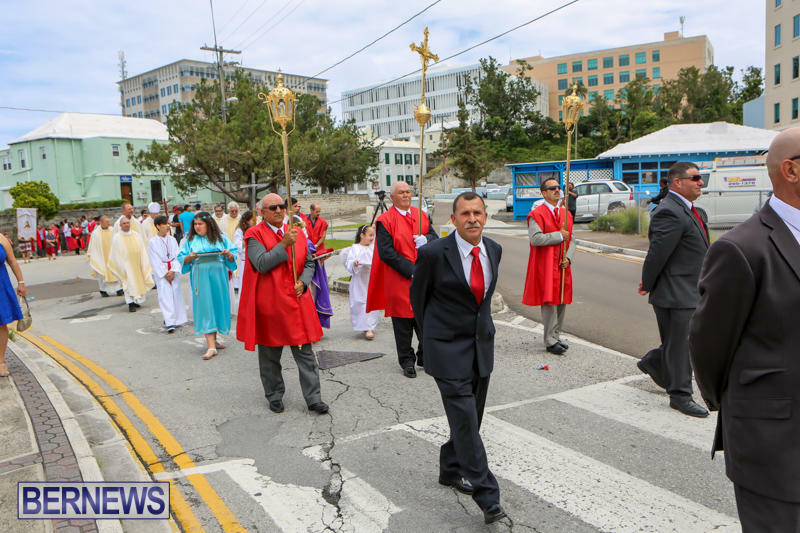 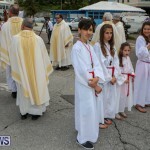 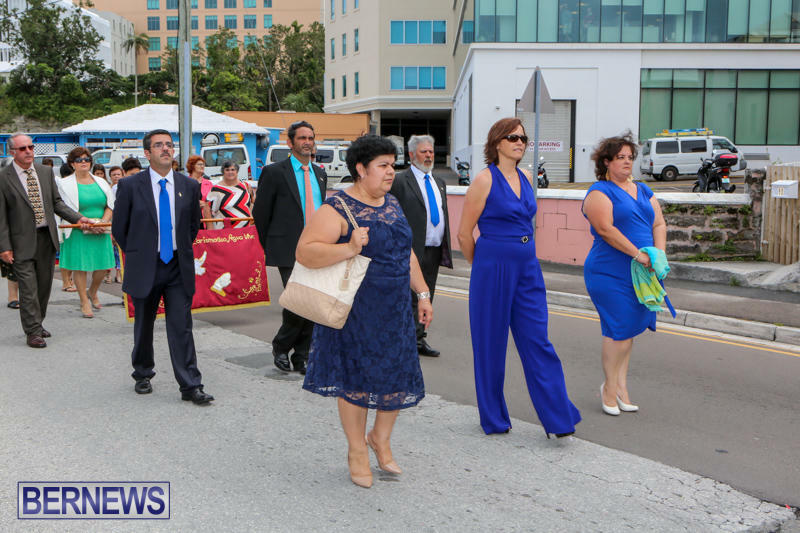 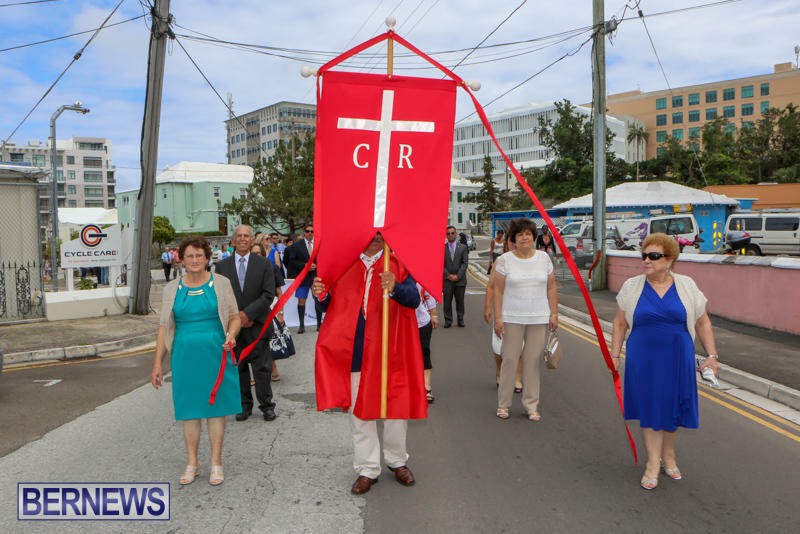 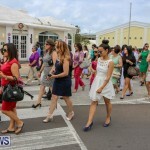 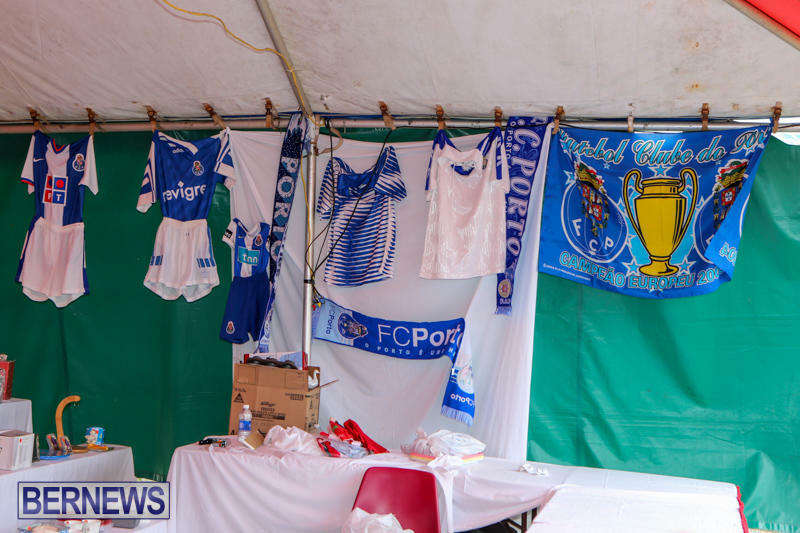 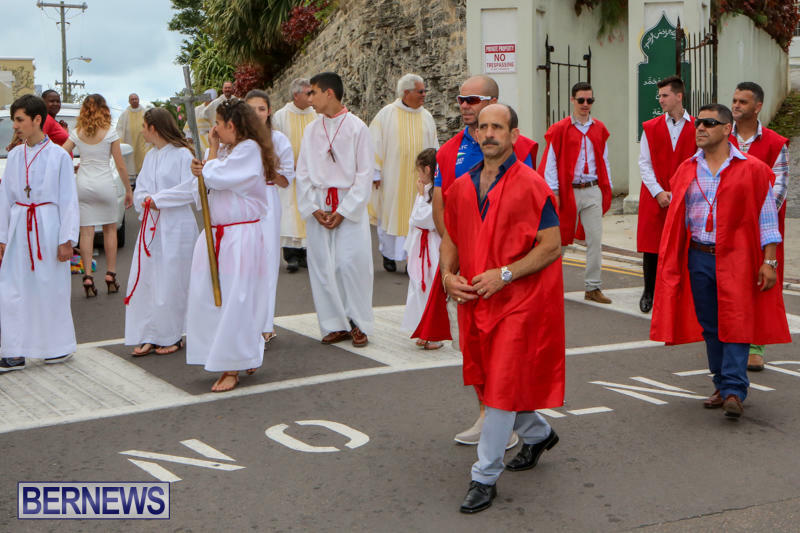 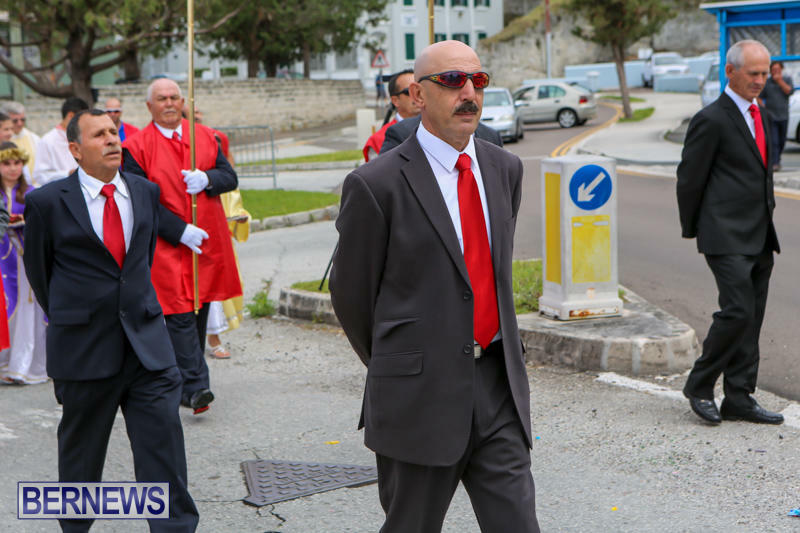 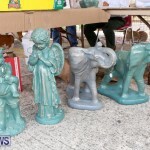 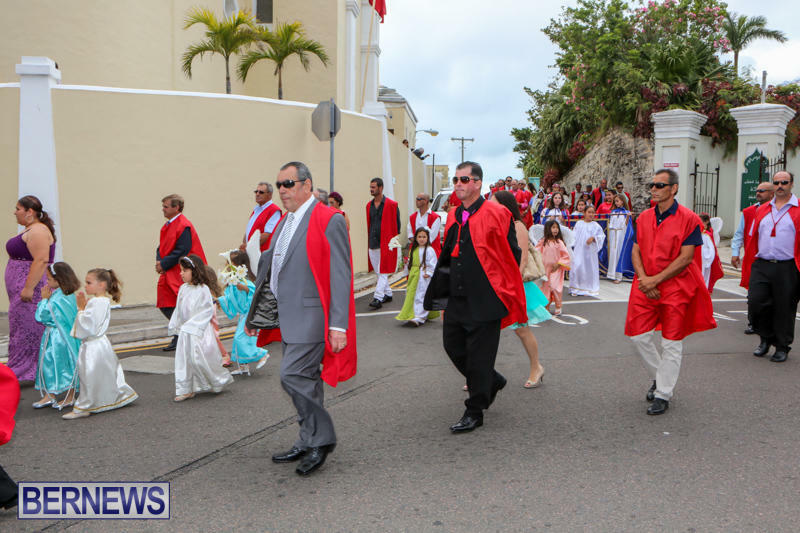 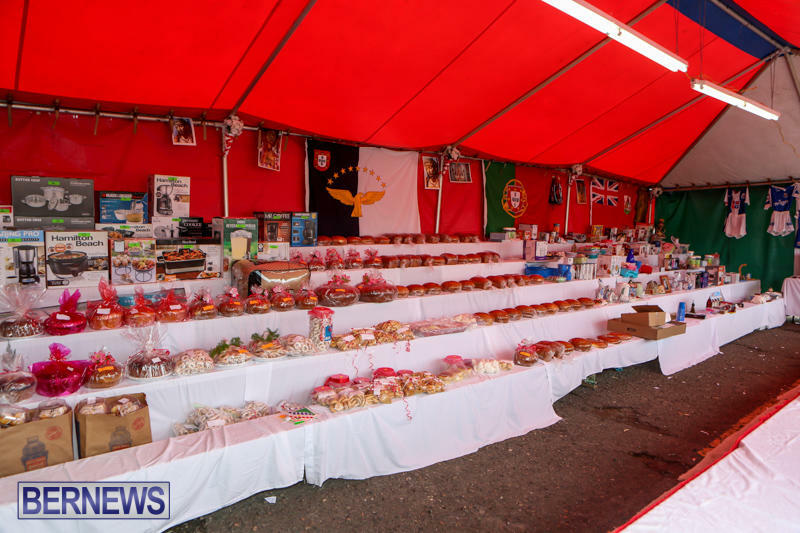 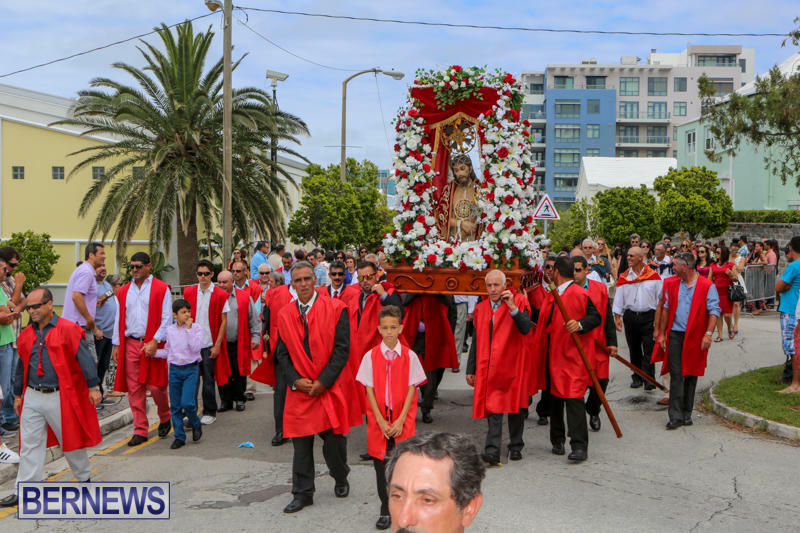 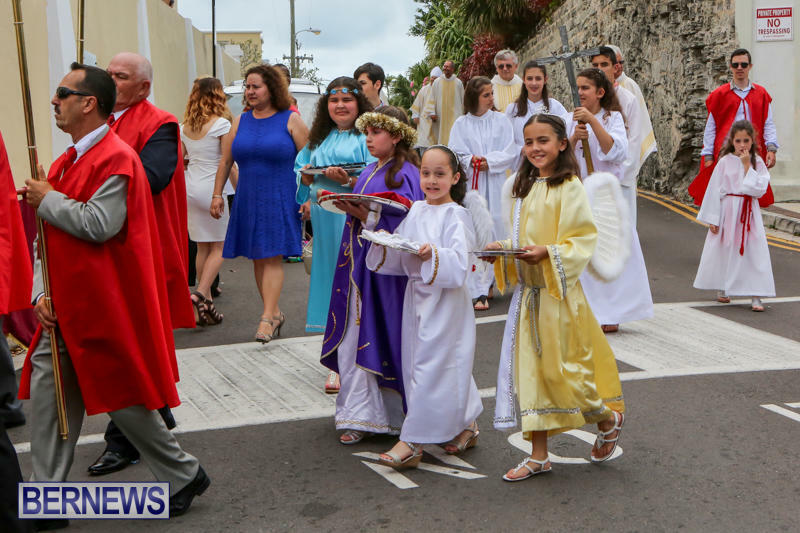 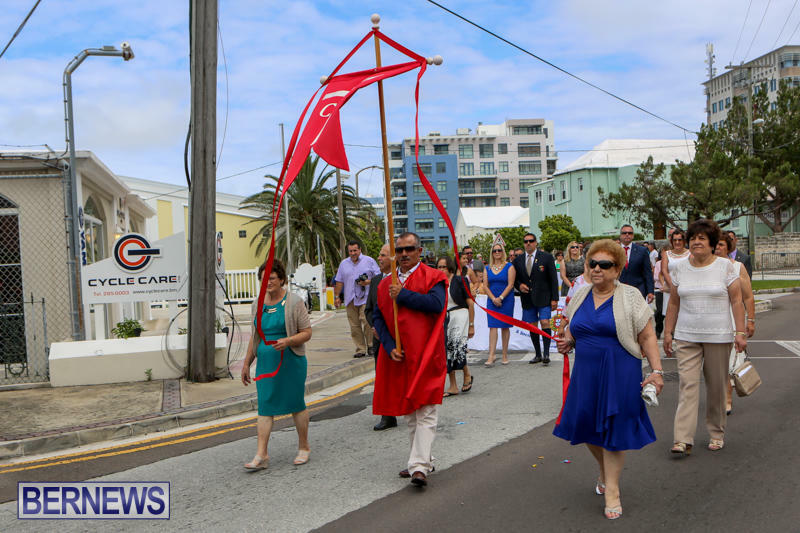 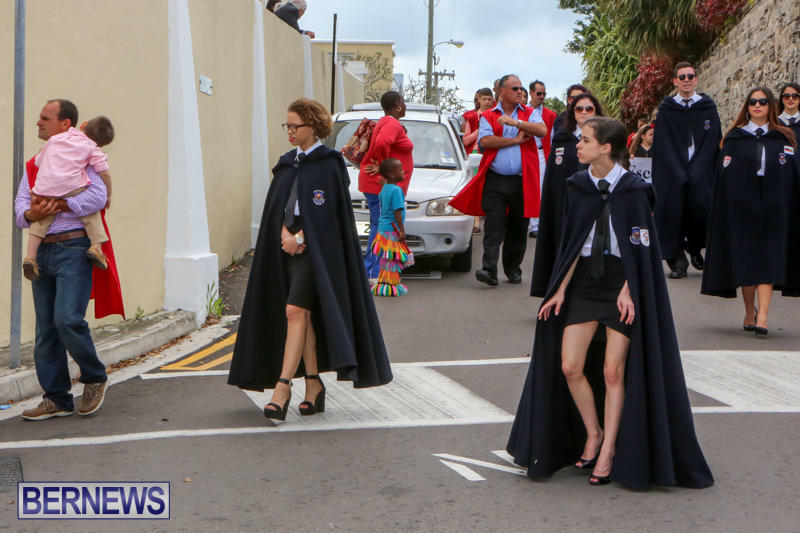 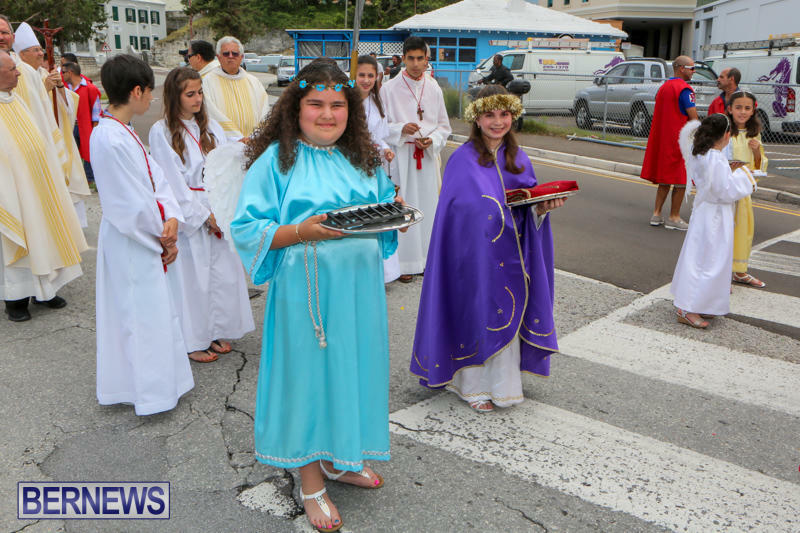 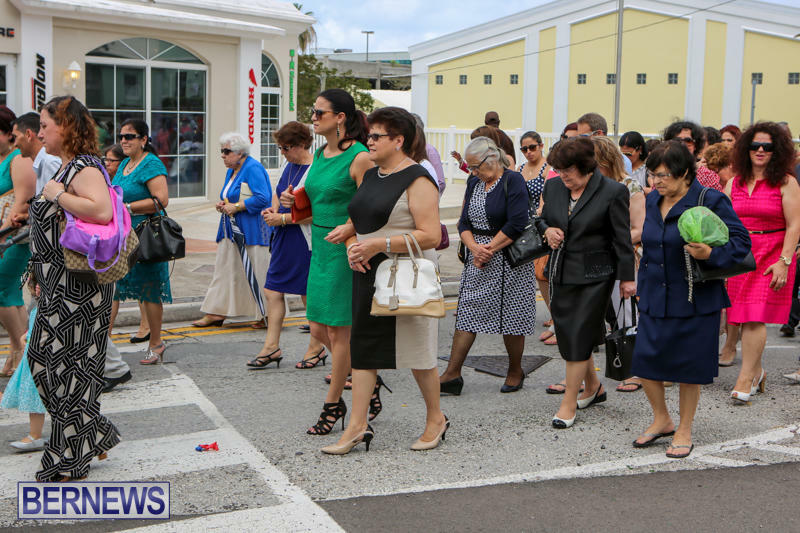 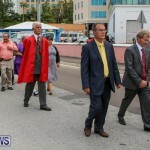 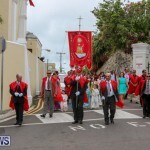 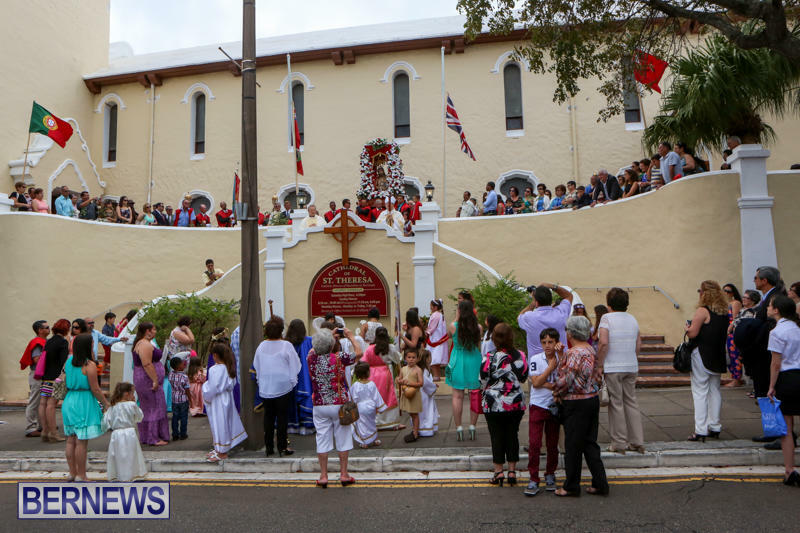 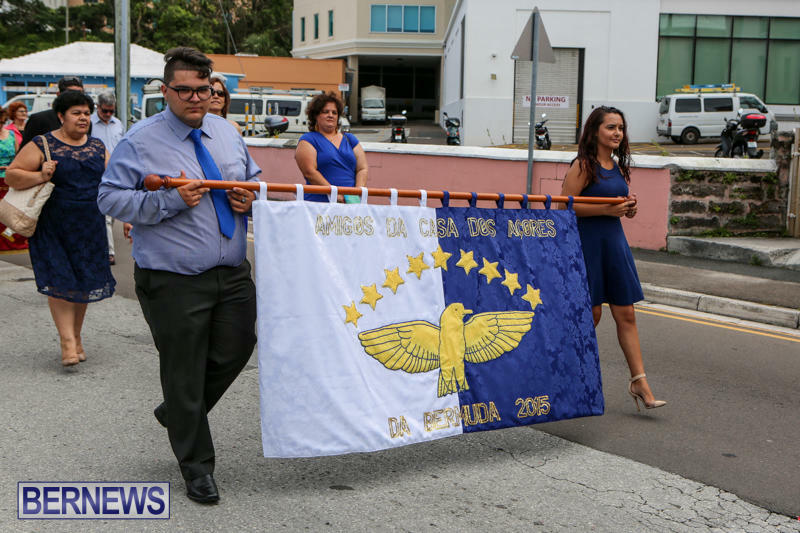 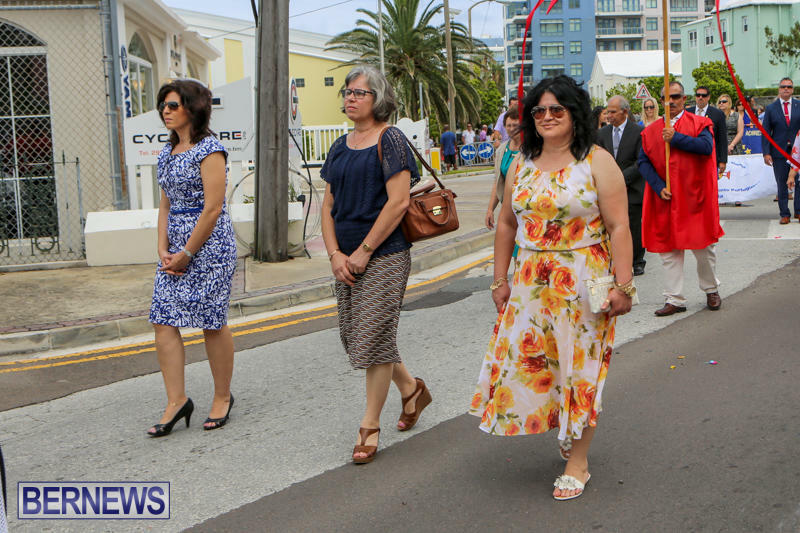 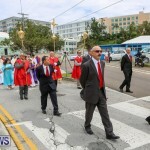 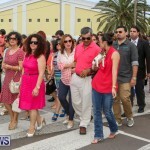 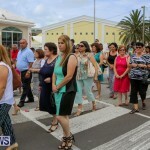 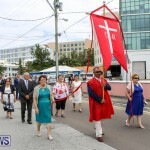 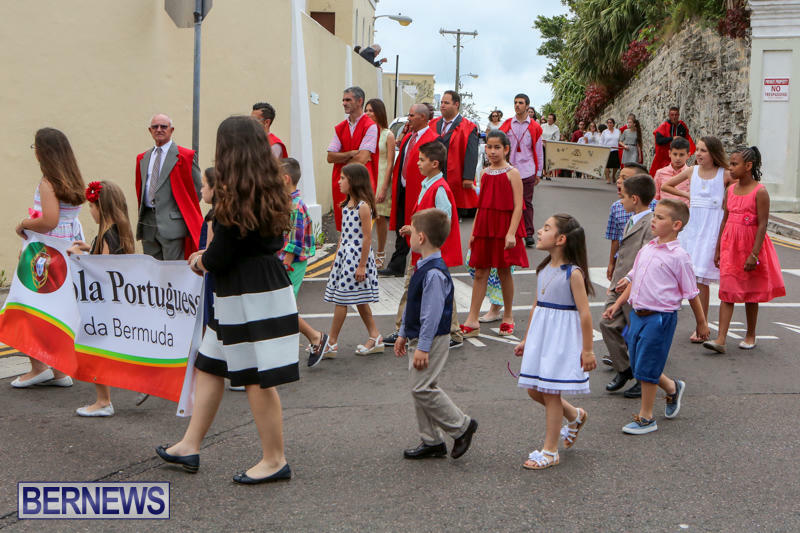 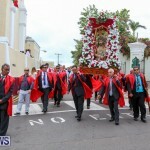 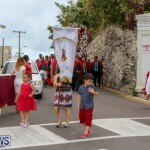 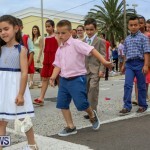 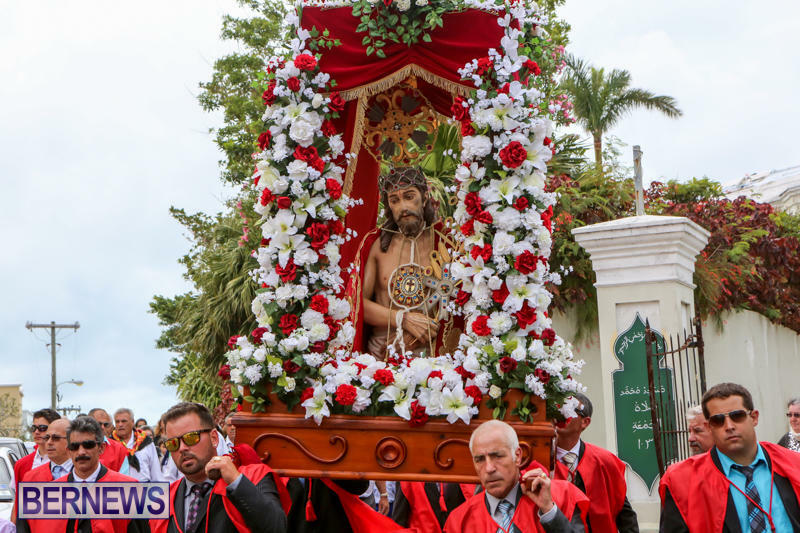 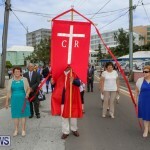 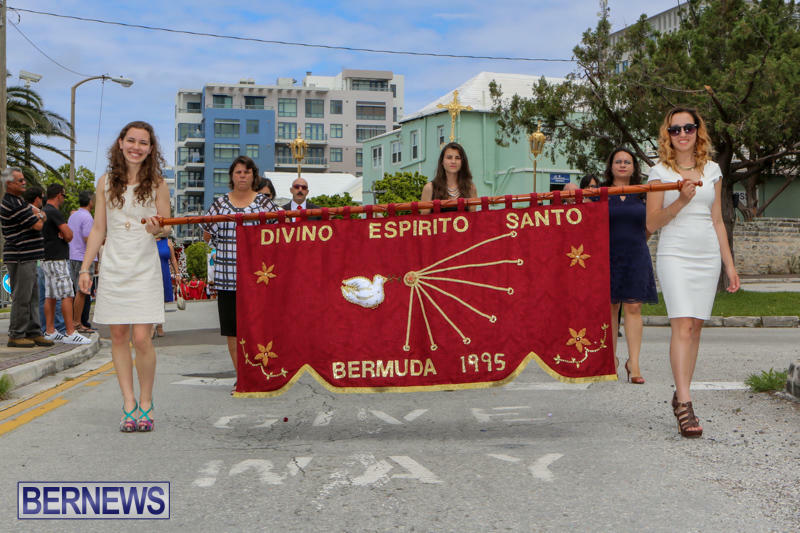 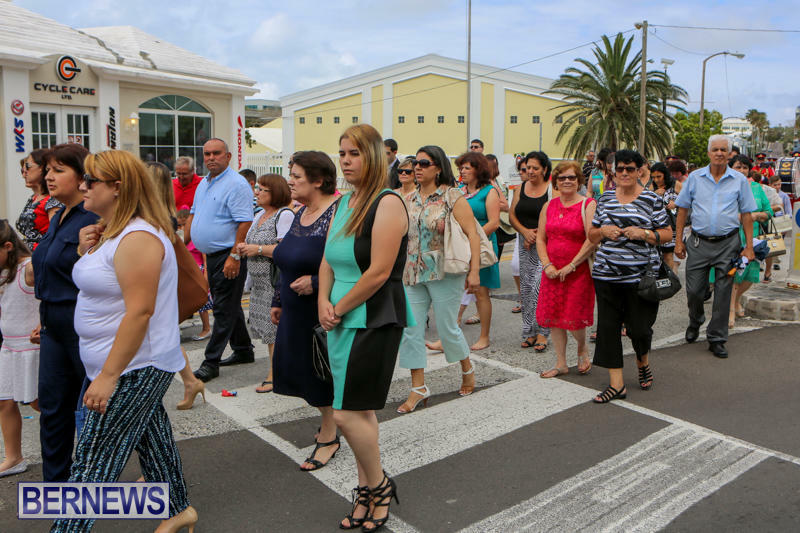 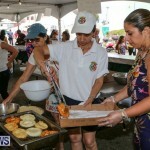 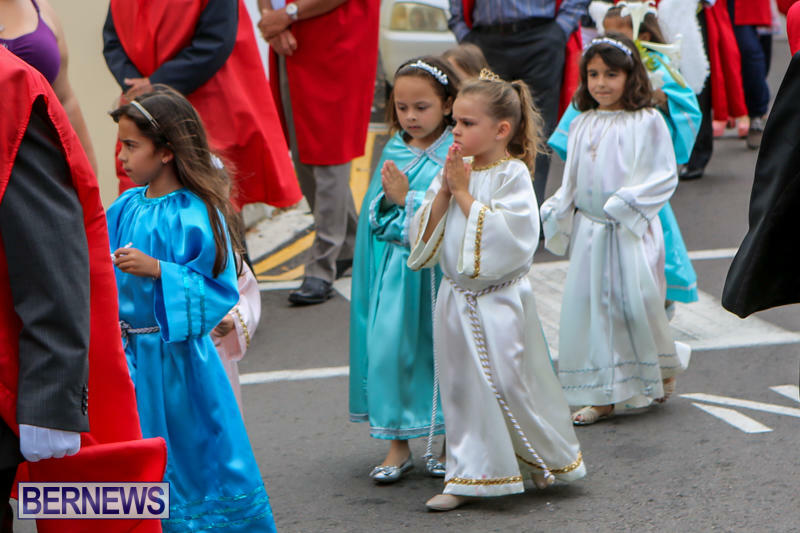 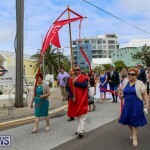 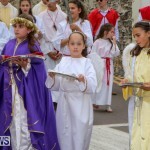 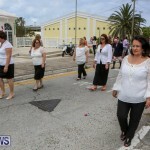 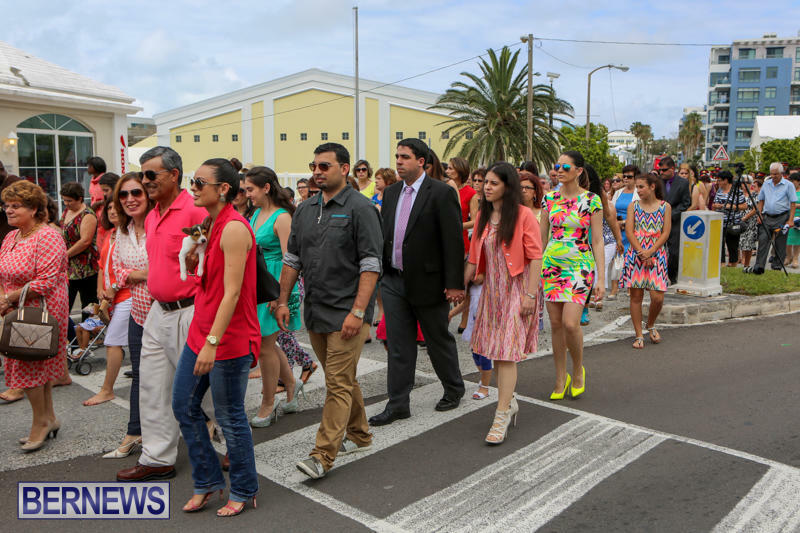 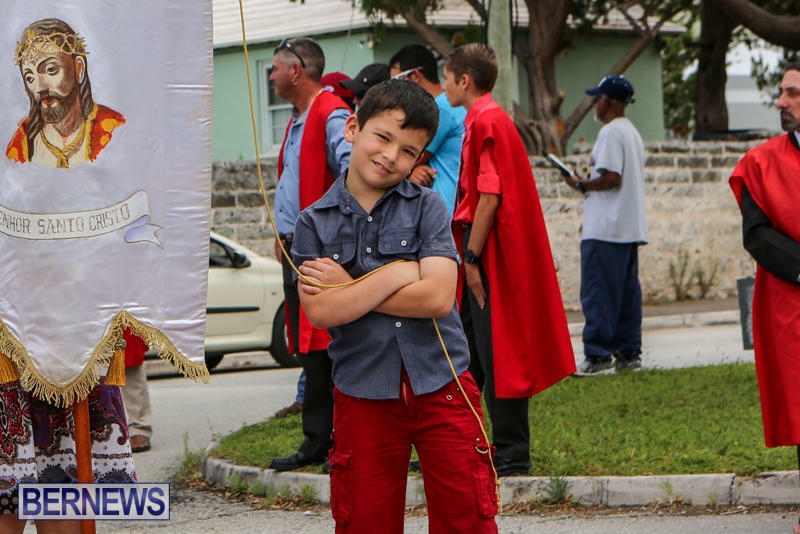 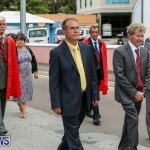 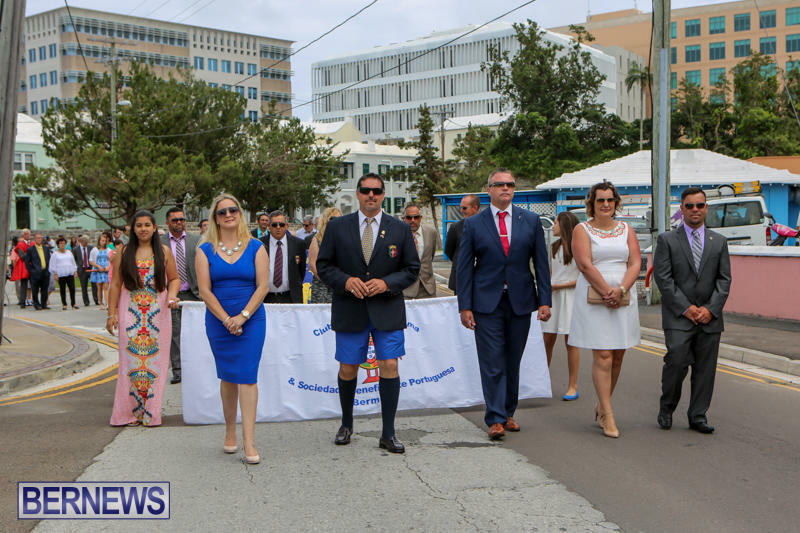 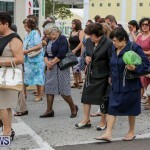 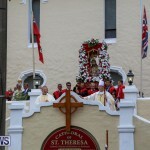 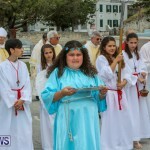 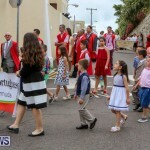 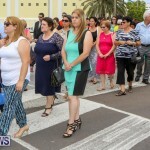 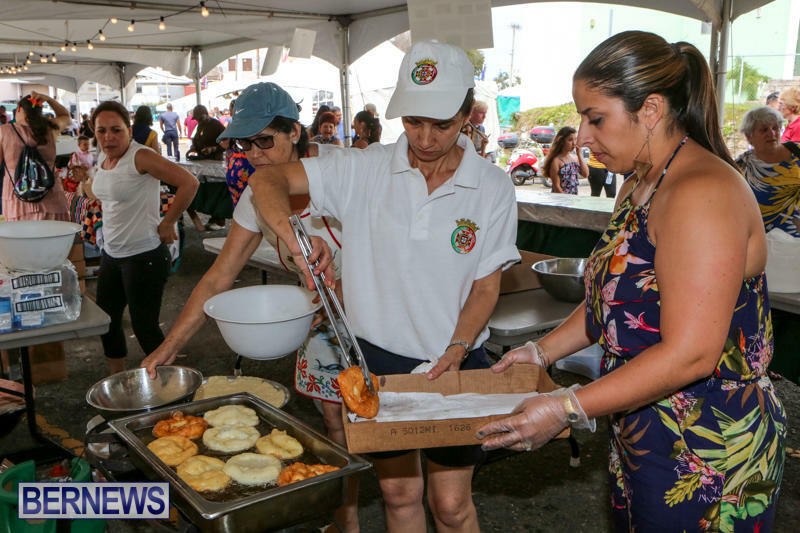 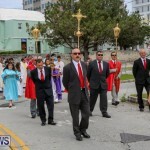 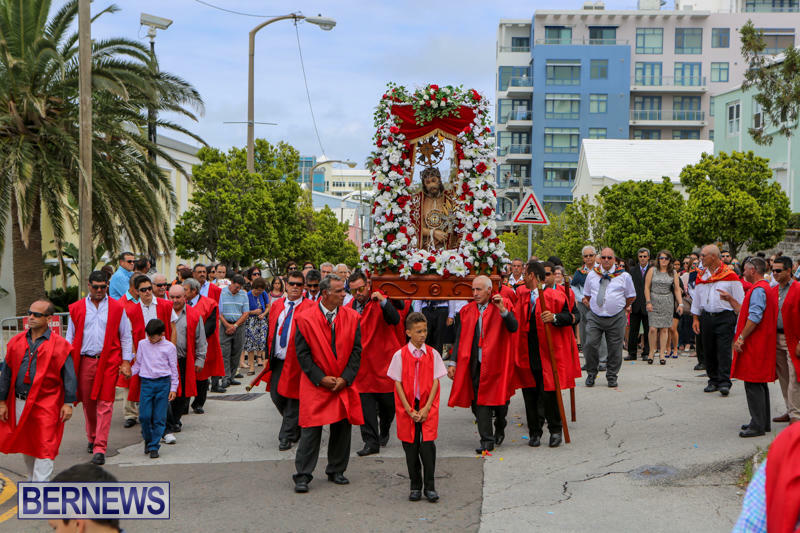 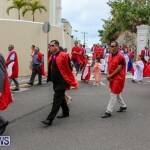 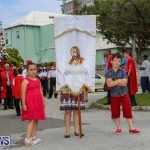 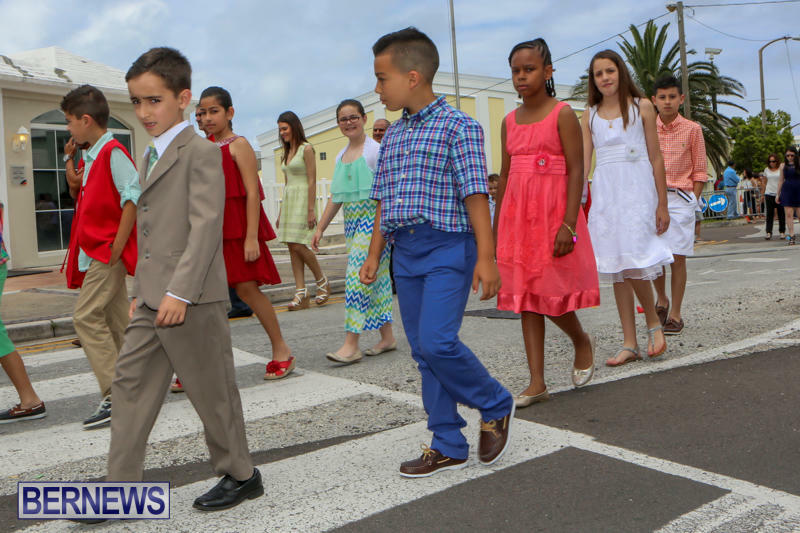 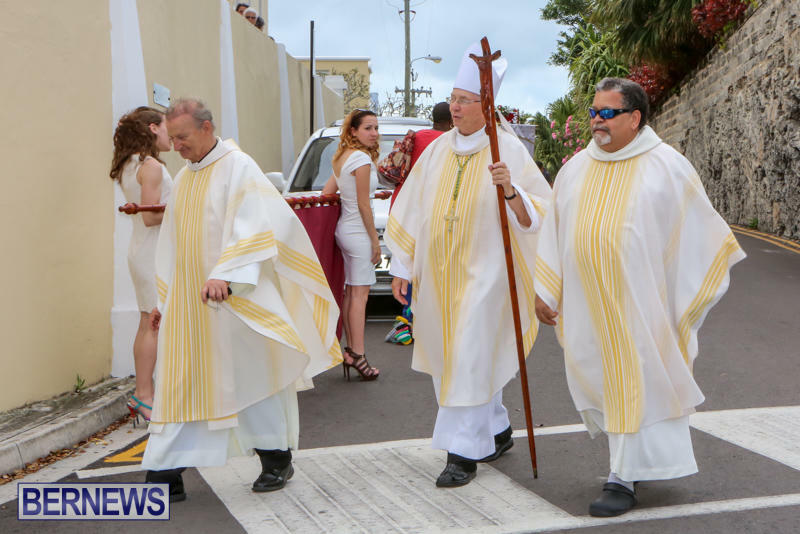 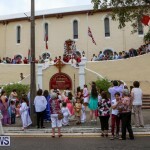 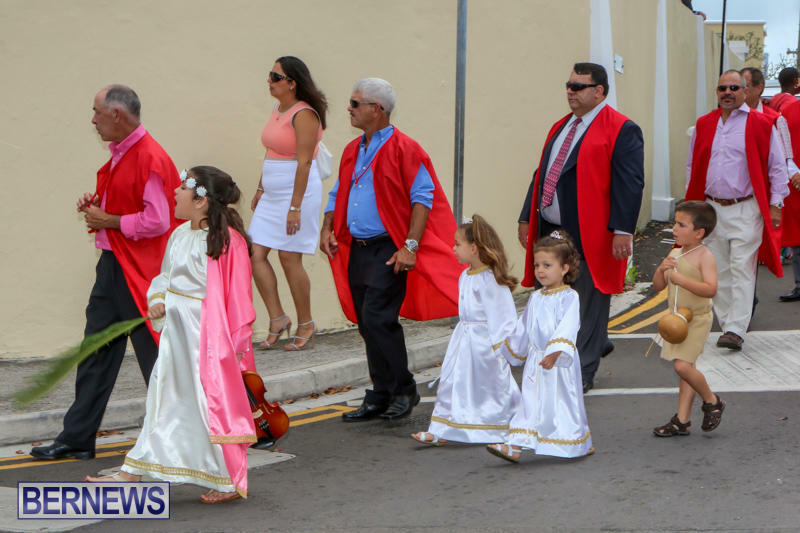 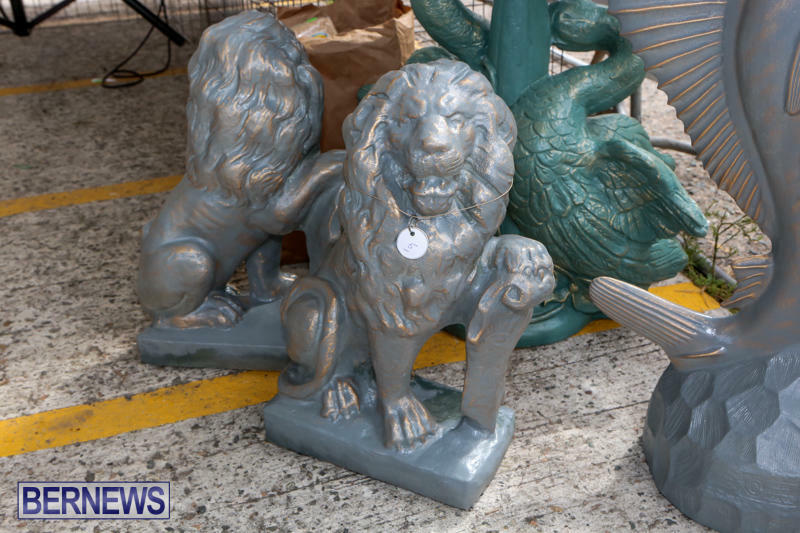 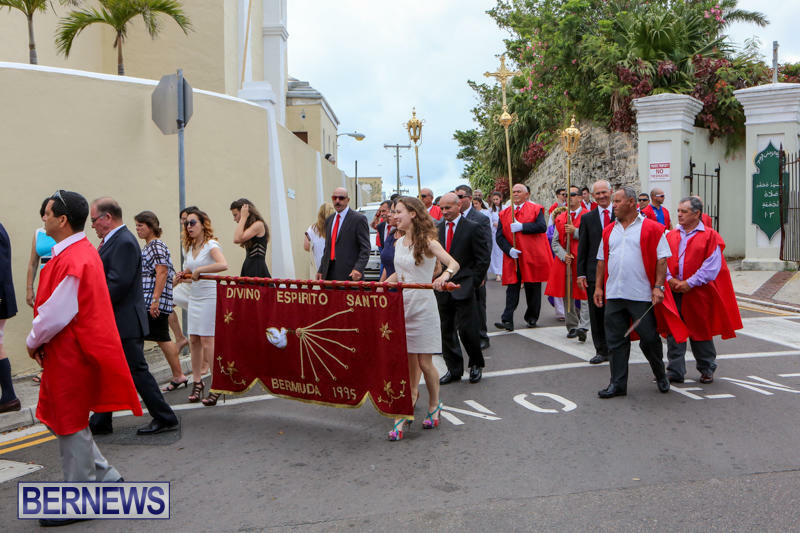 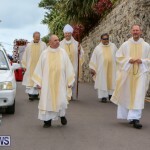 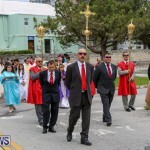 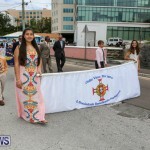 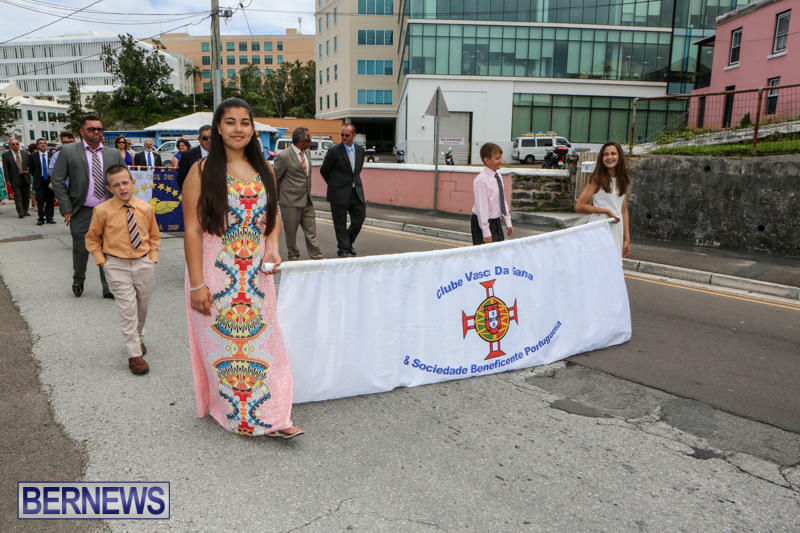 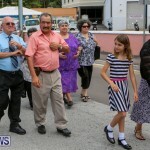 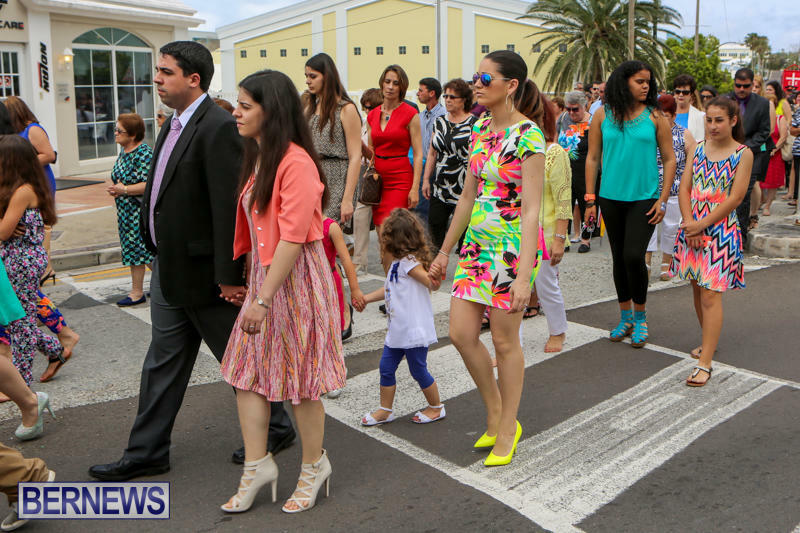 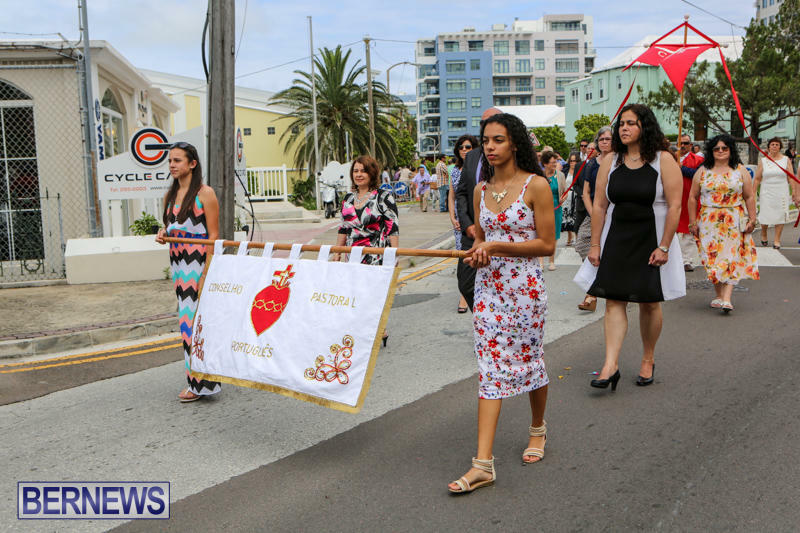 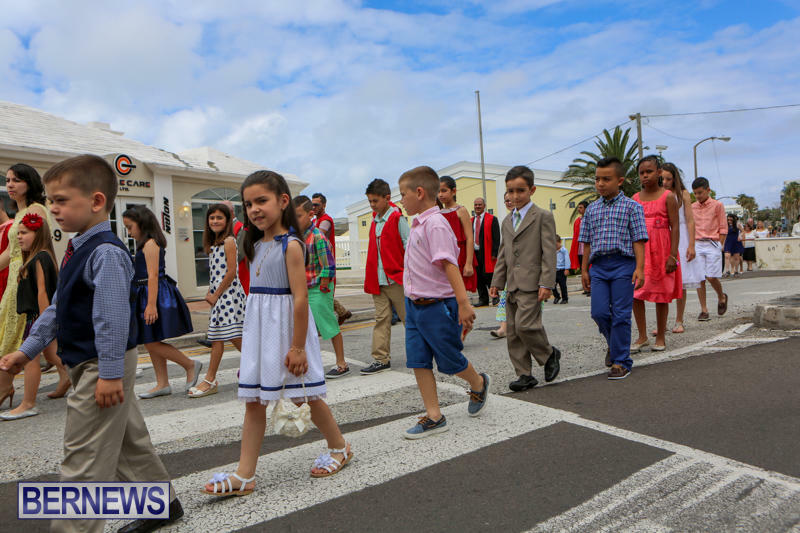 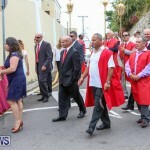 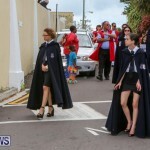 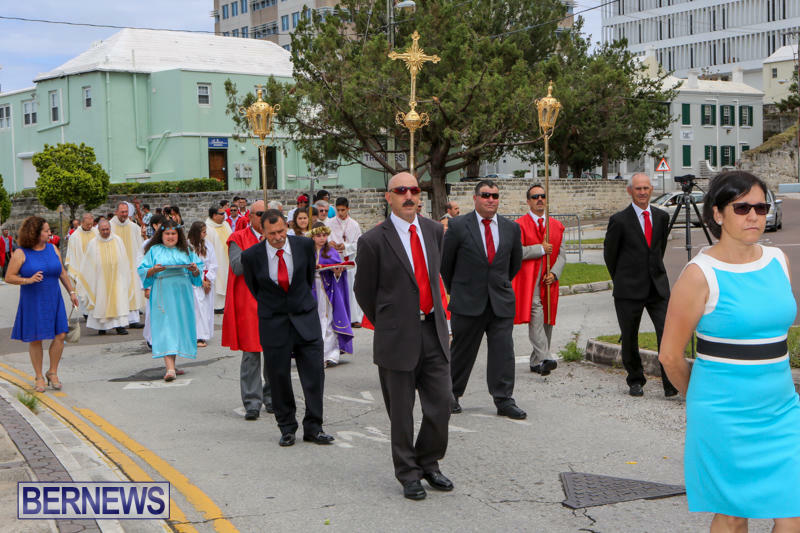 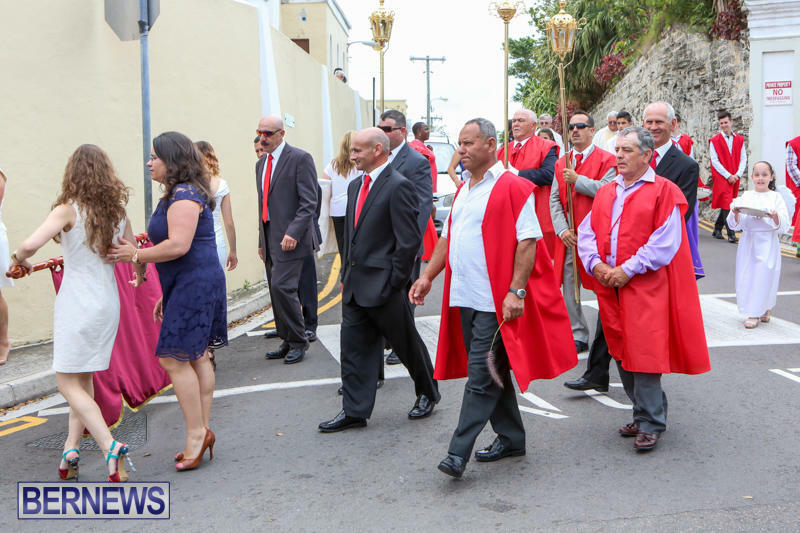 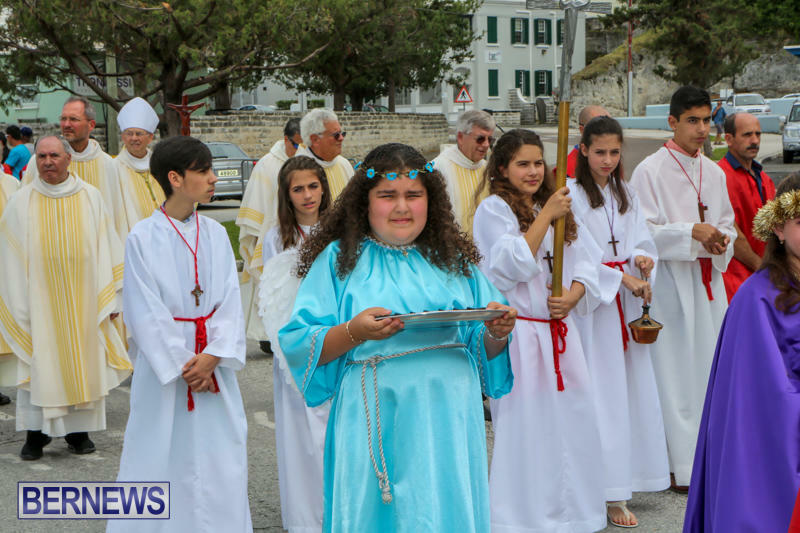 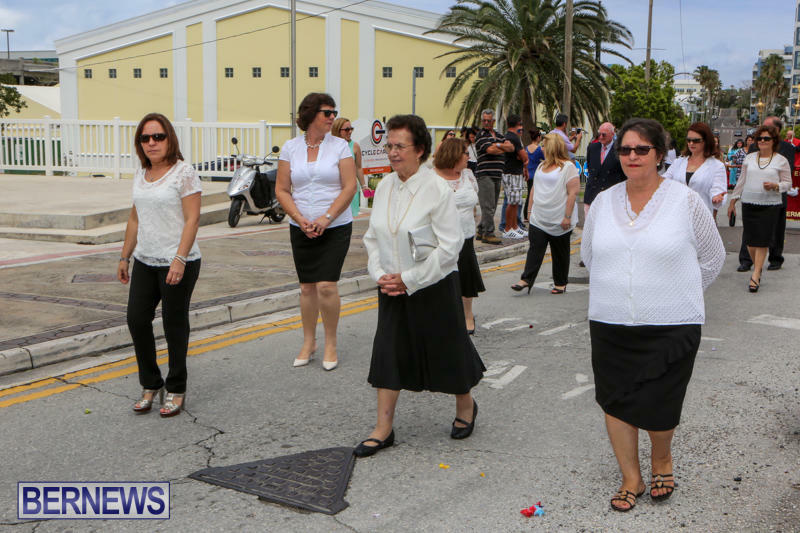 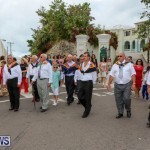 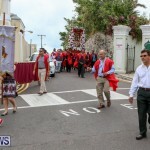 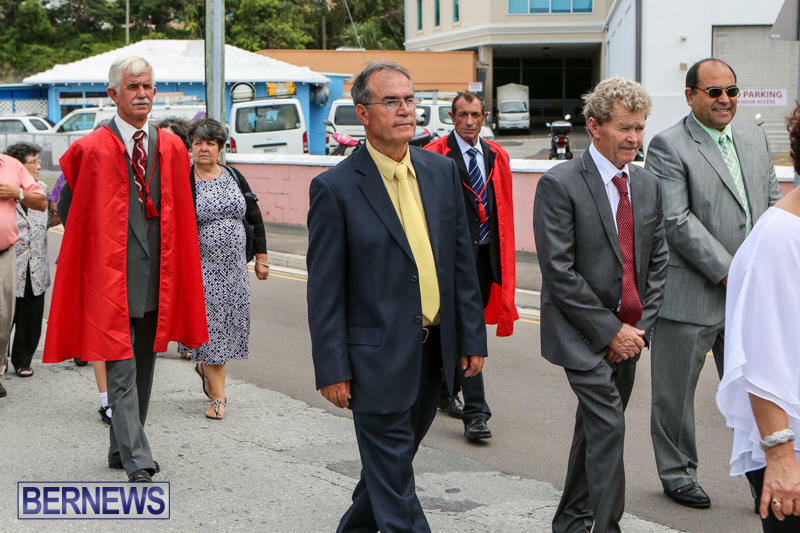 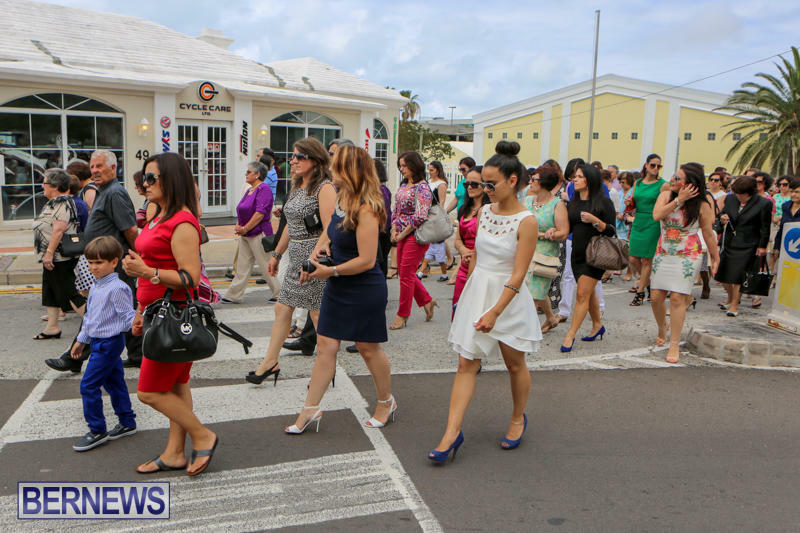 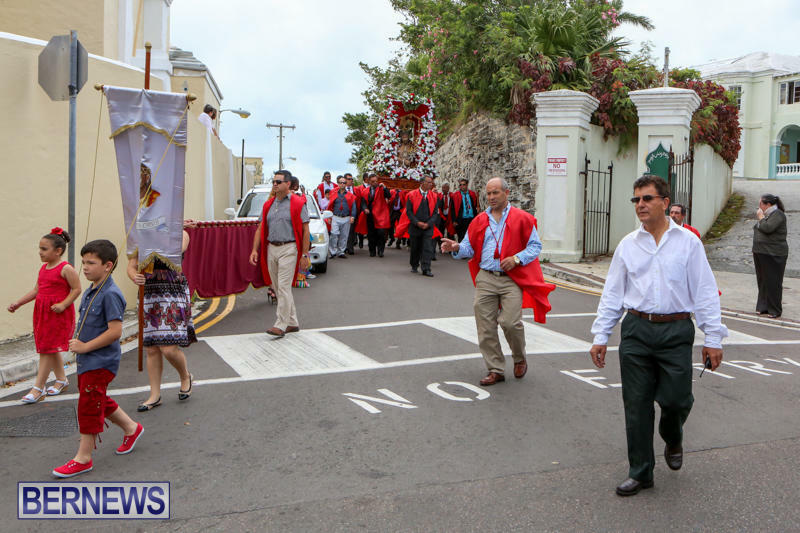 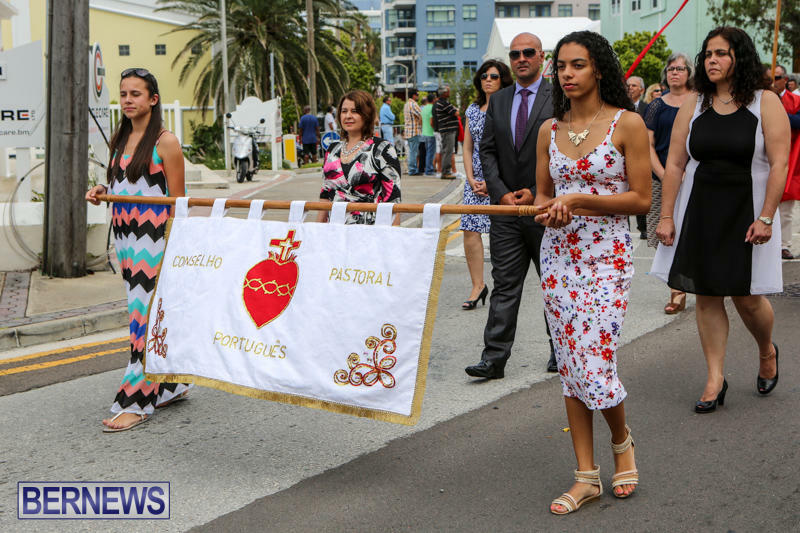 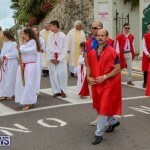 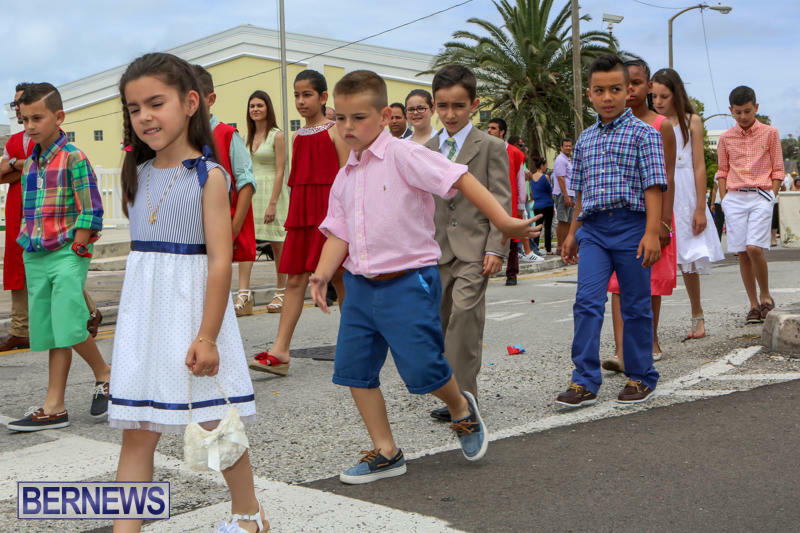 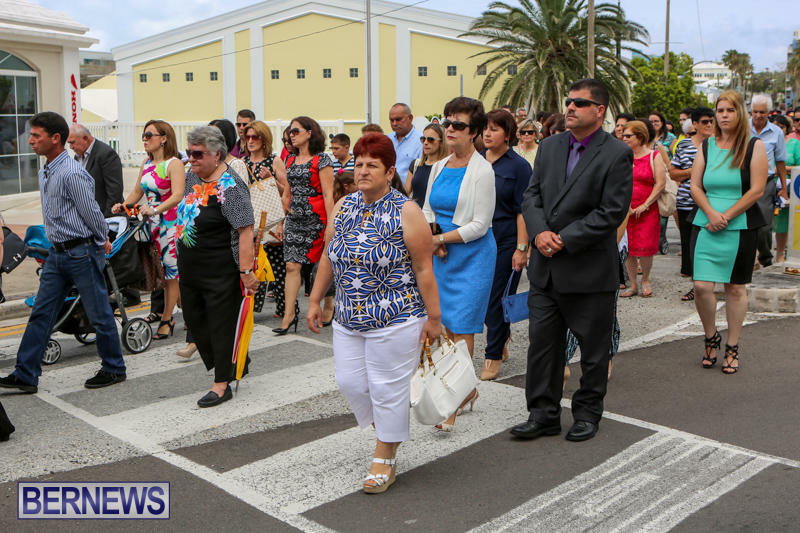 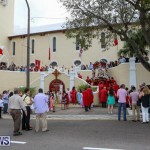 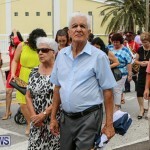 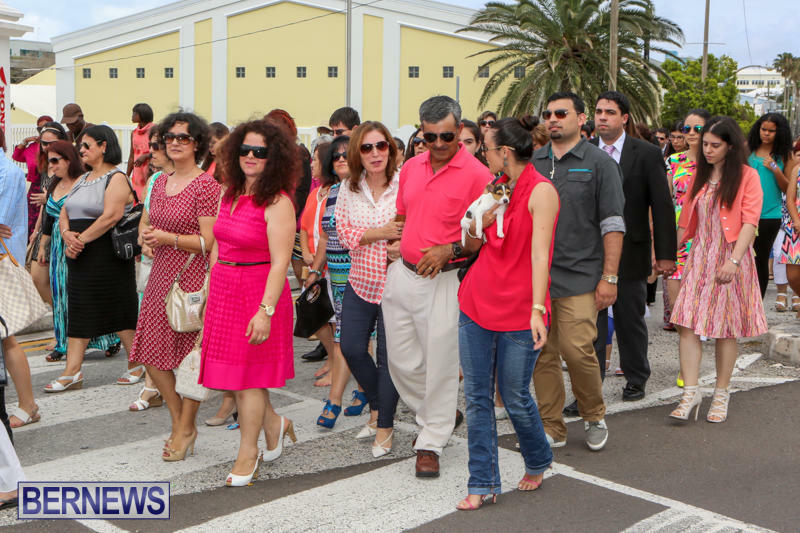 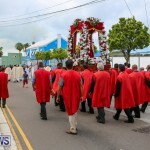 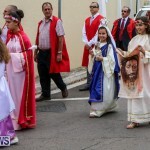 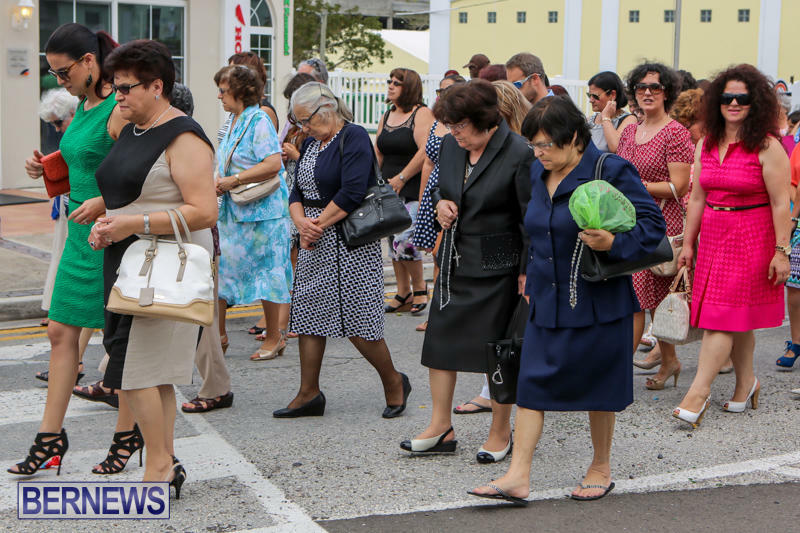 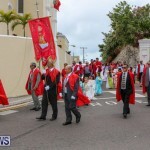 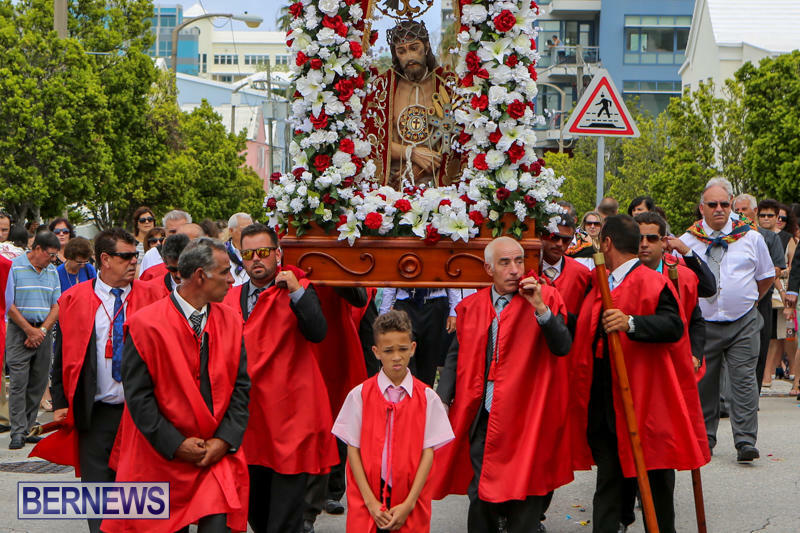 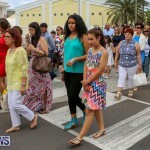 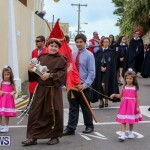 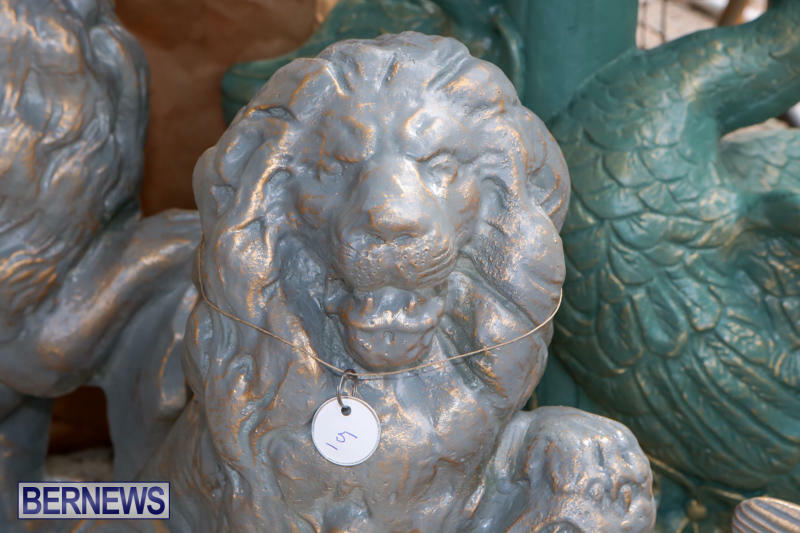 A centuries old tradition that originated in the Azores in the 17th century took place today [May 10] with Bermuda’s Portuguese community coming together to celebrate the “Festa do Senhor Santo Cristo dos Milagres”. 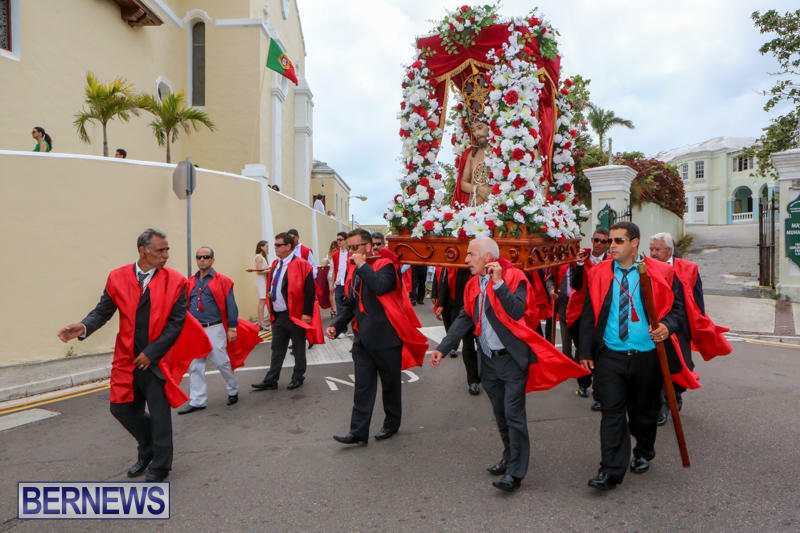 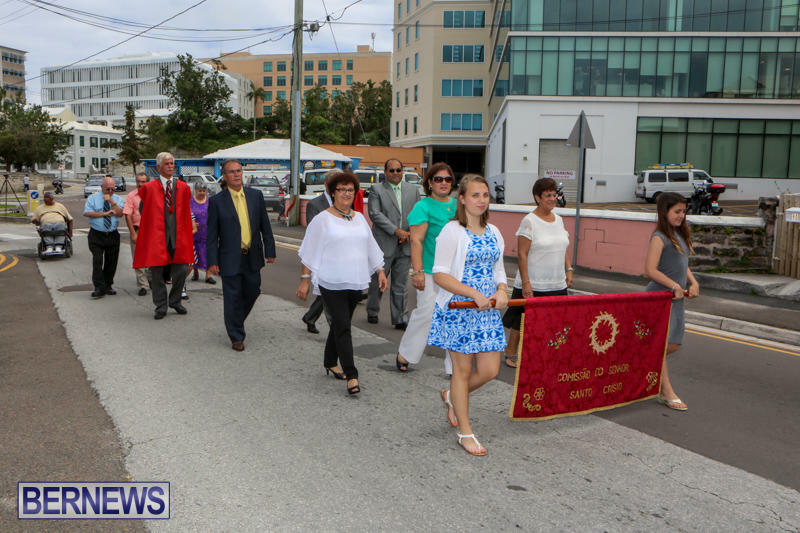 The “Festa do Senhor Santo Cristo dos Milagres” [Festival of the Christ of Miracles], sees a solemn procession through Hamilton with participants leaving St. Teresa’s Cathedral after an afternoon service. 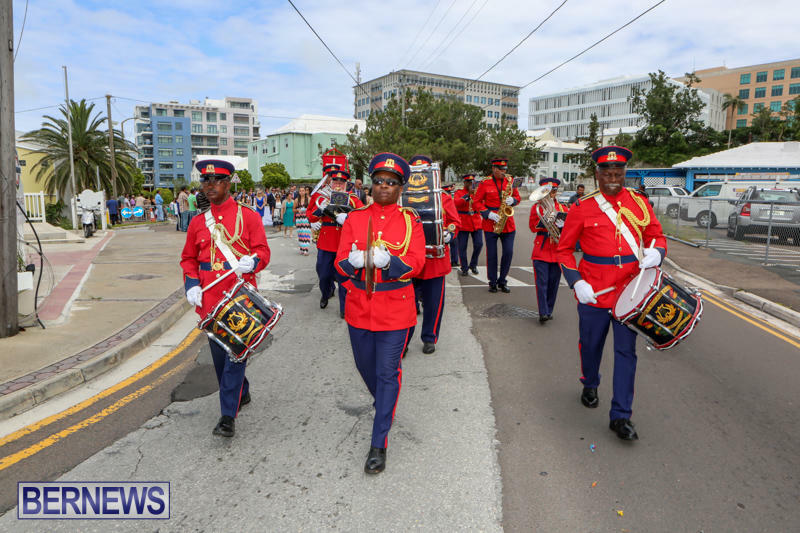 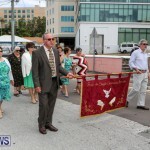 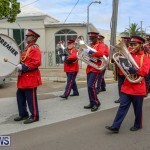 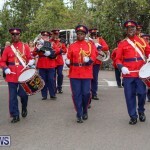 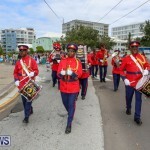 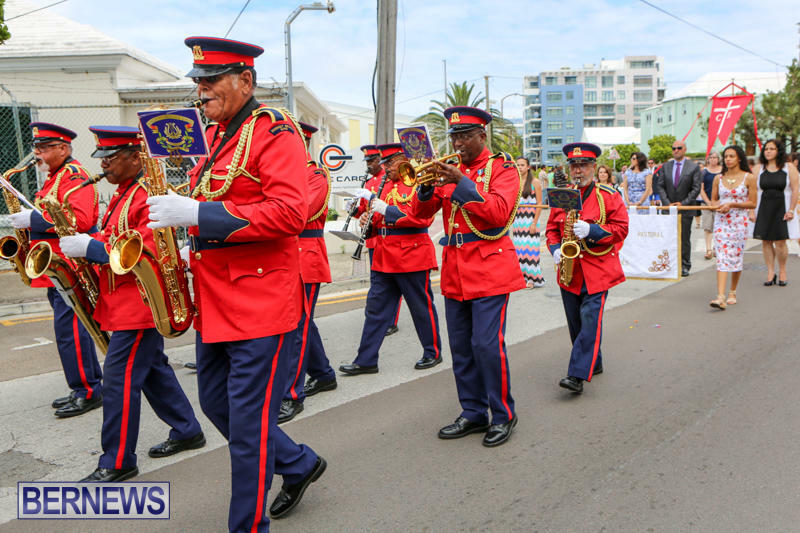 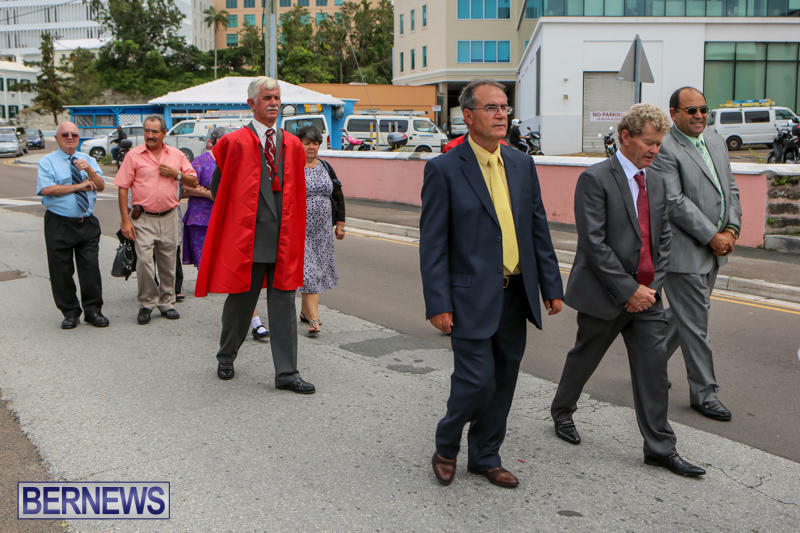 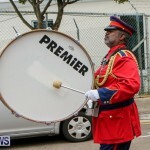 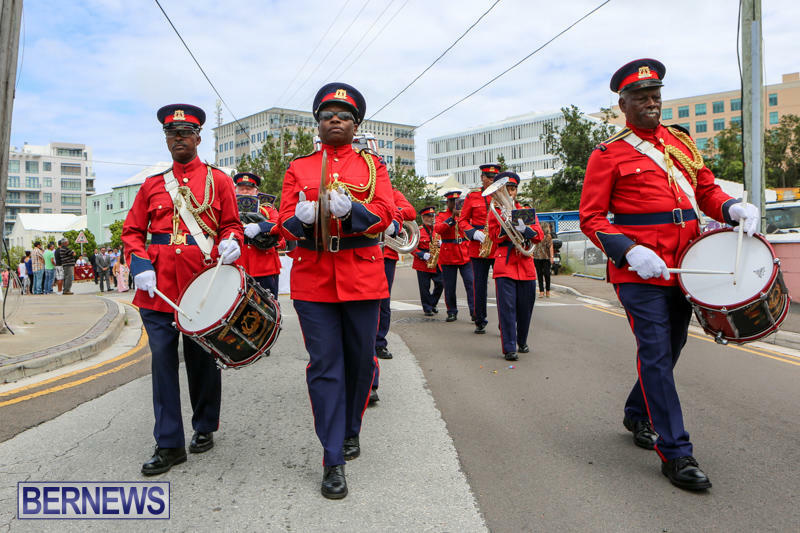 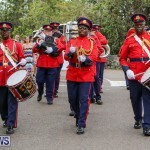 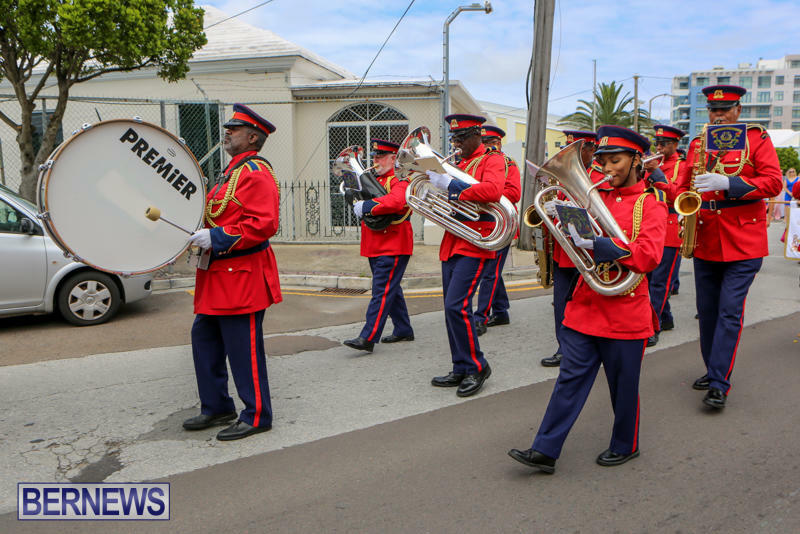 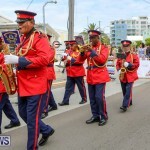 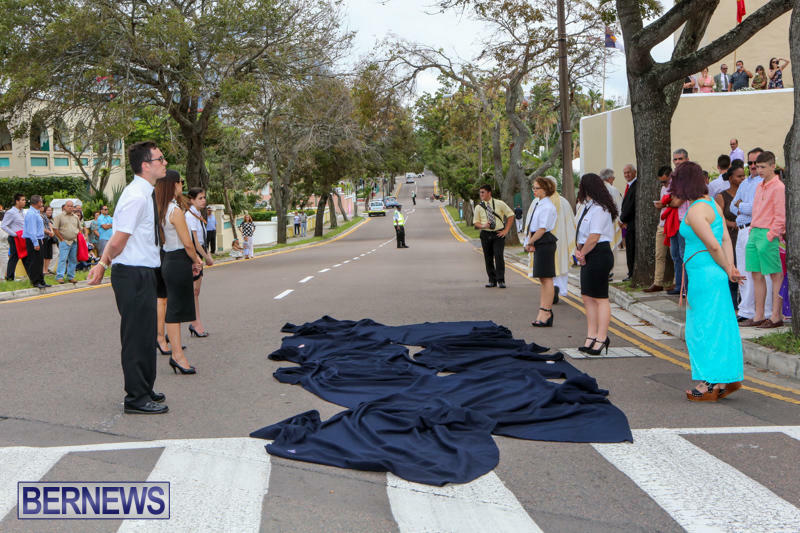 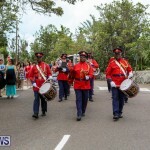 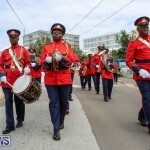 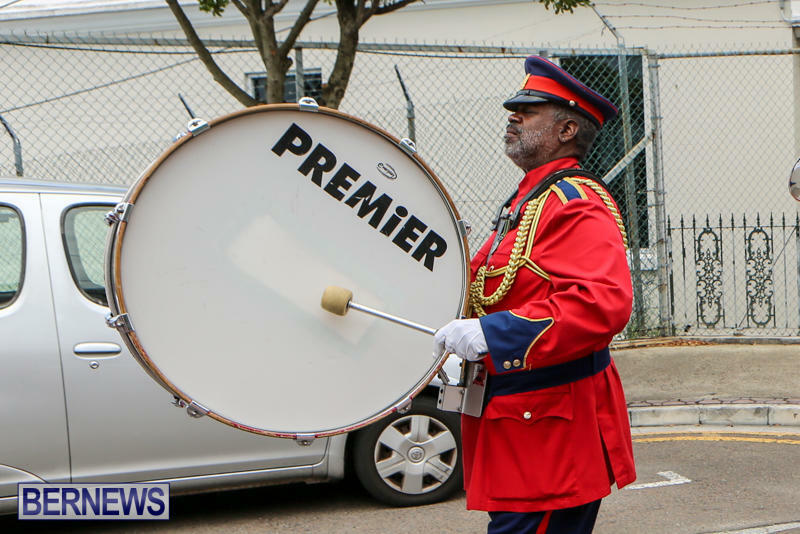 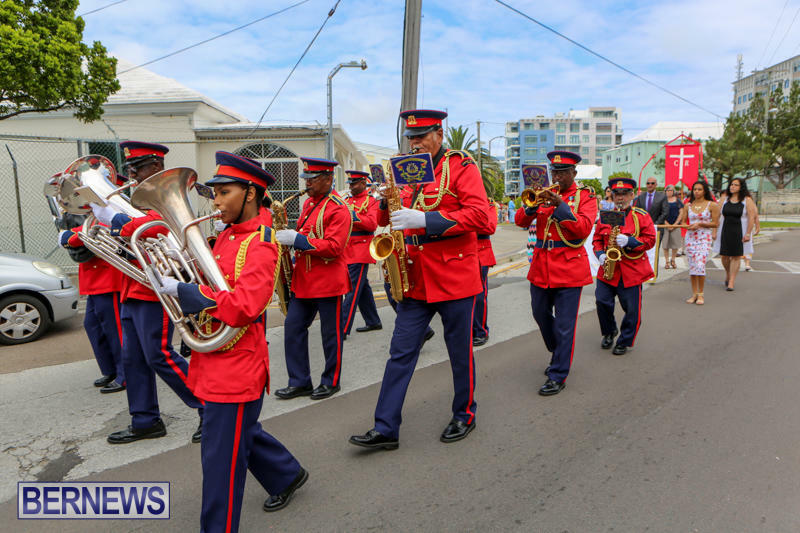 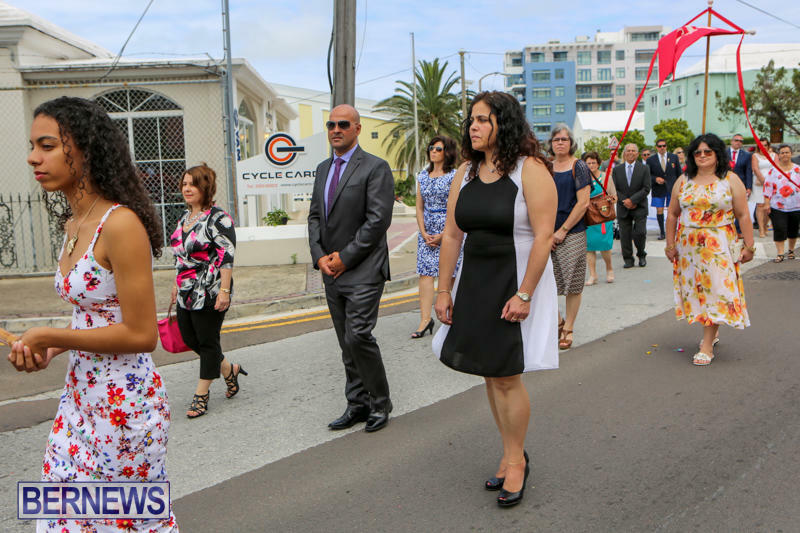 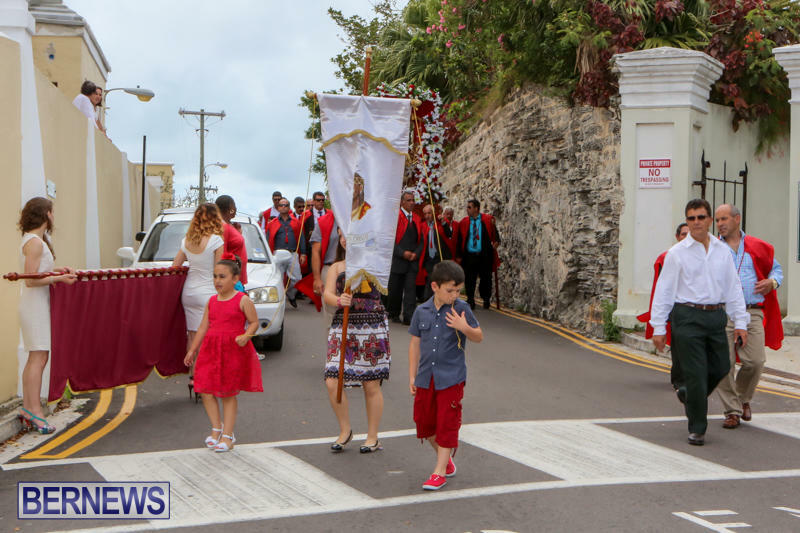 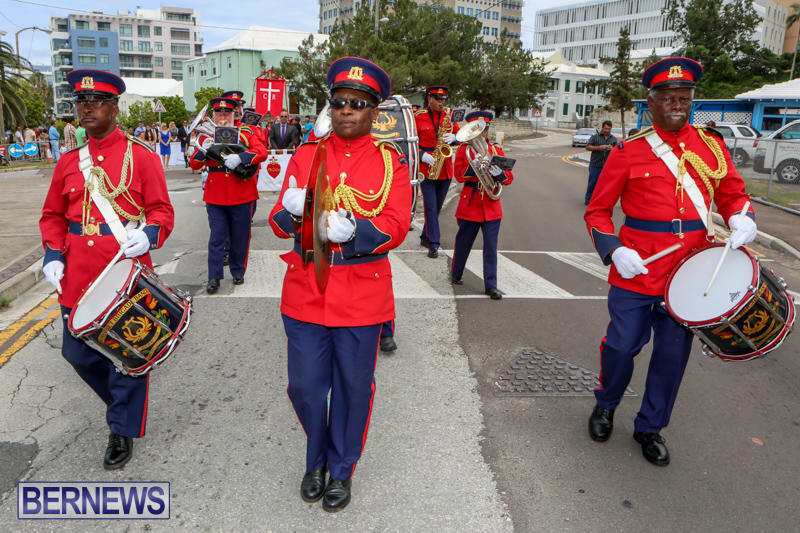 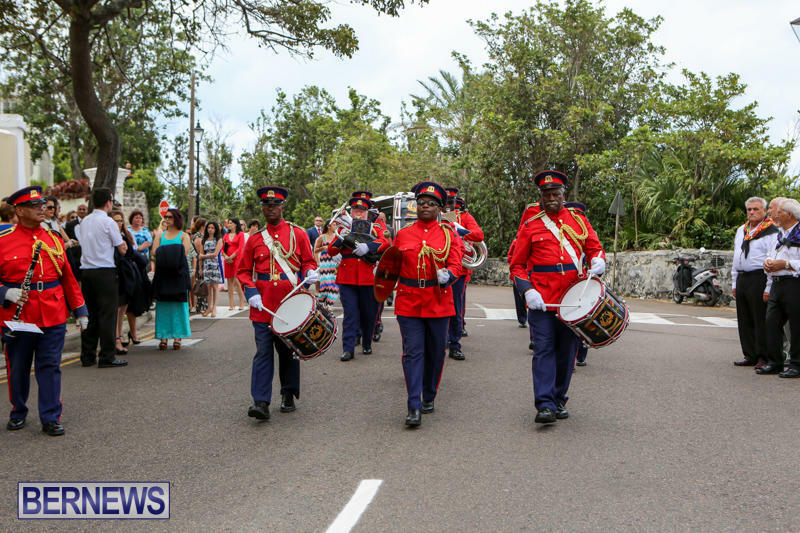 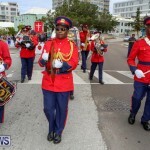 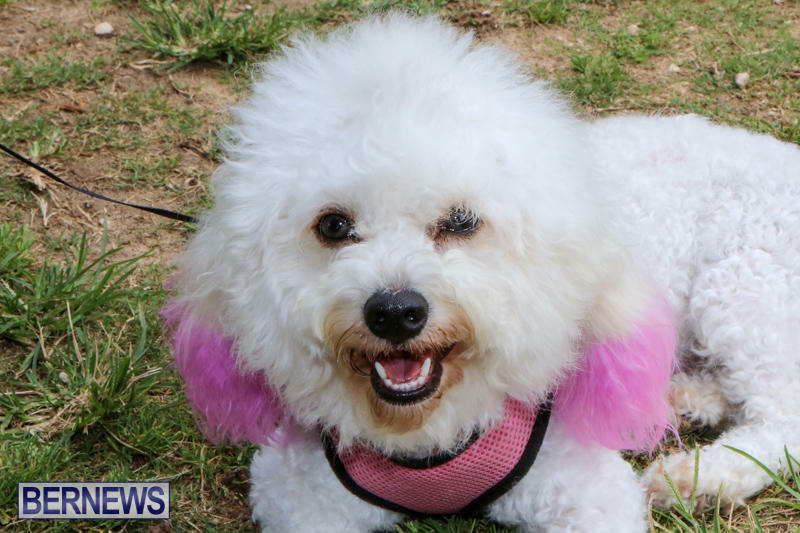 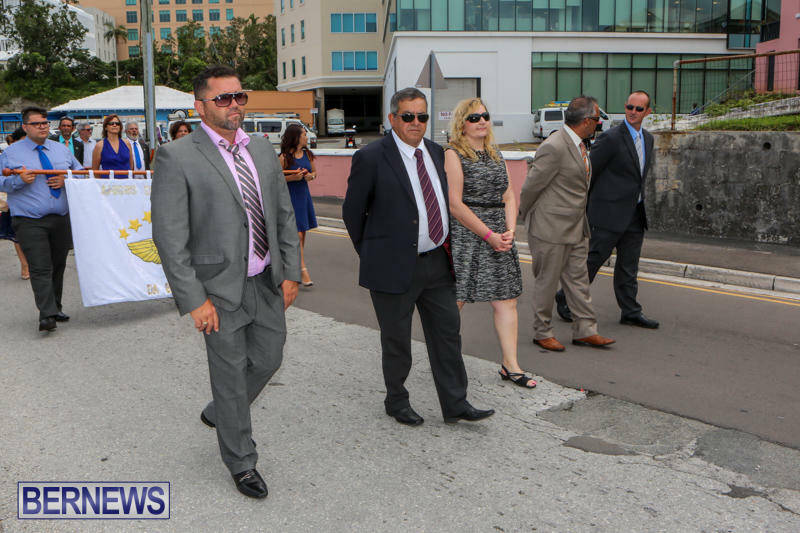 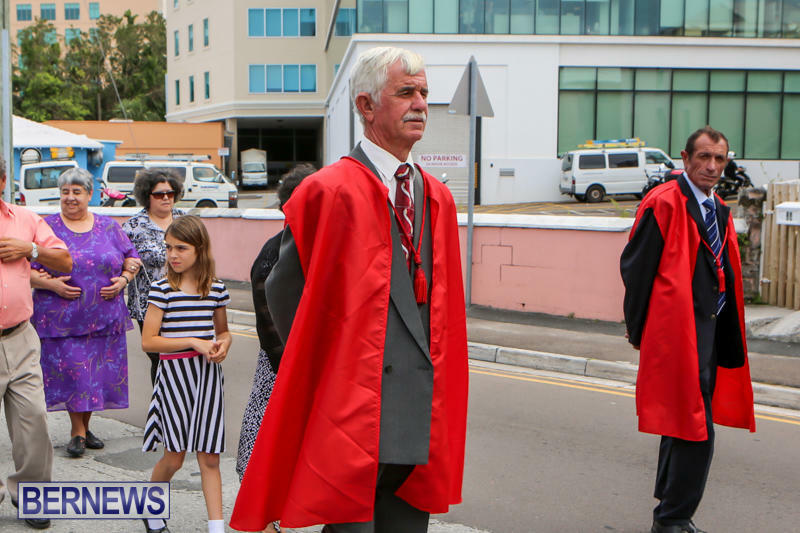 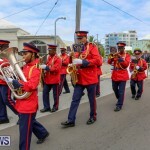 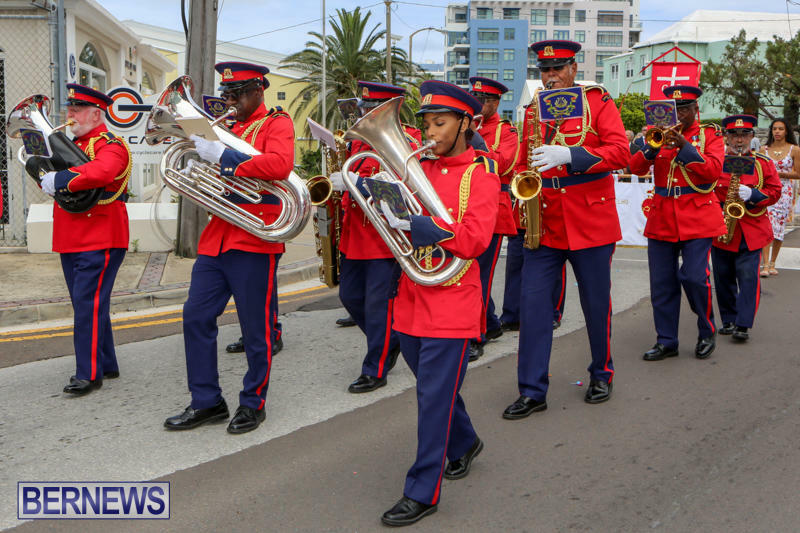 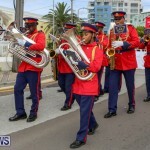 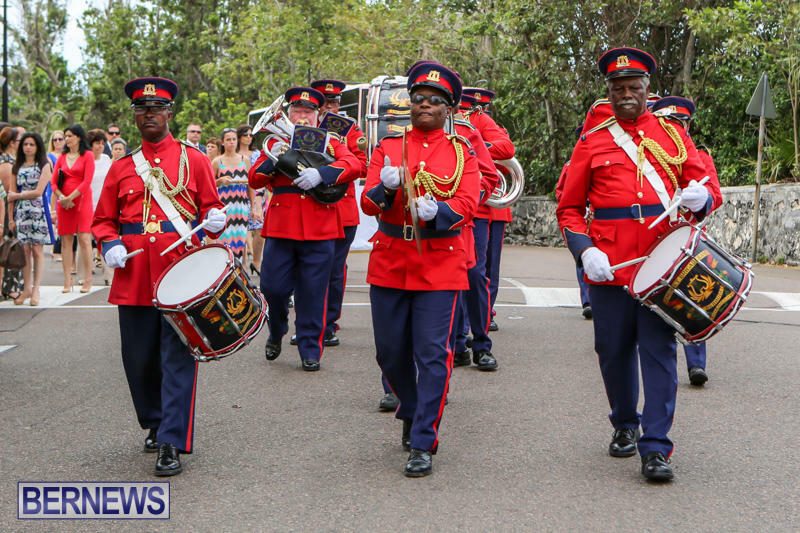 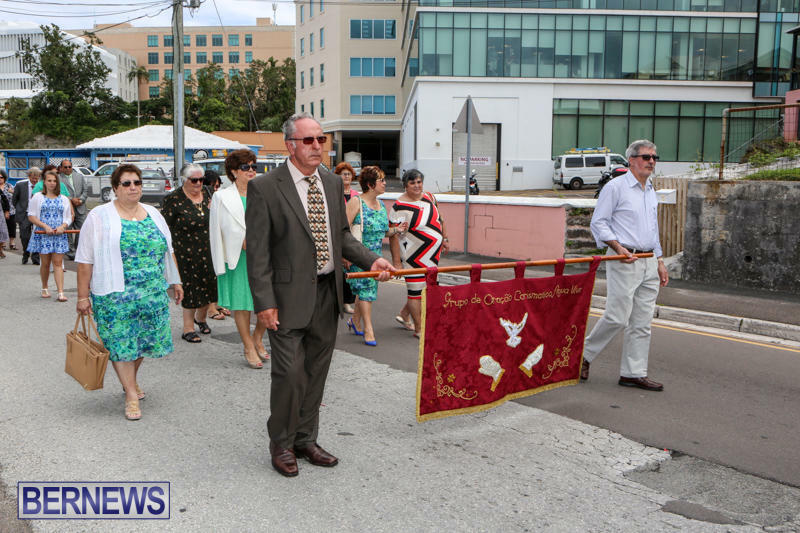 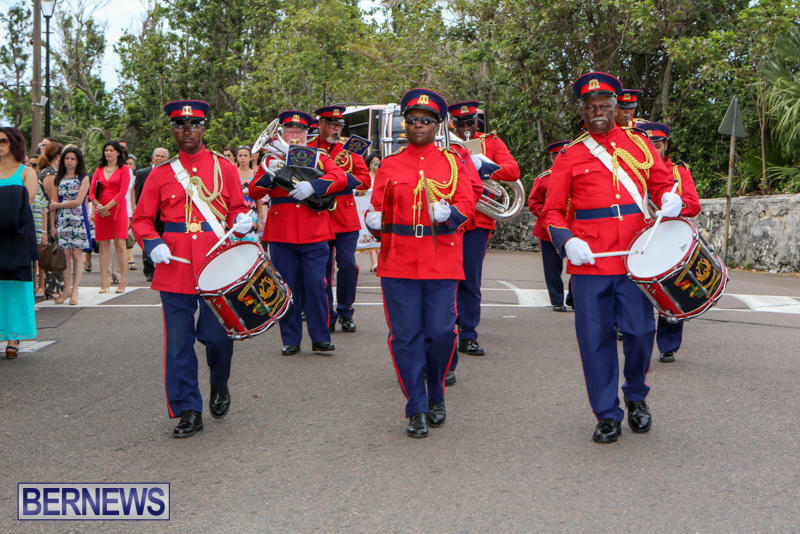 Accompanied by the Somerset Brigade Band, the procession traveled along Cedar Avenue turning on to Dundonald Street where the group walked over a carpet of flowers set down beforehand. 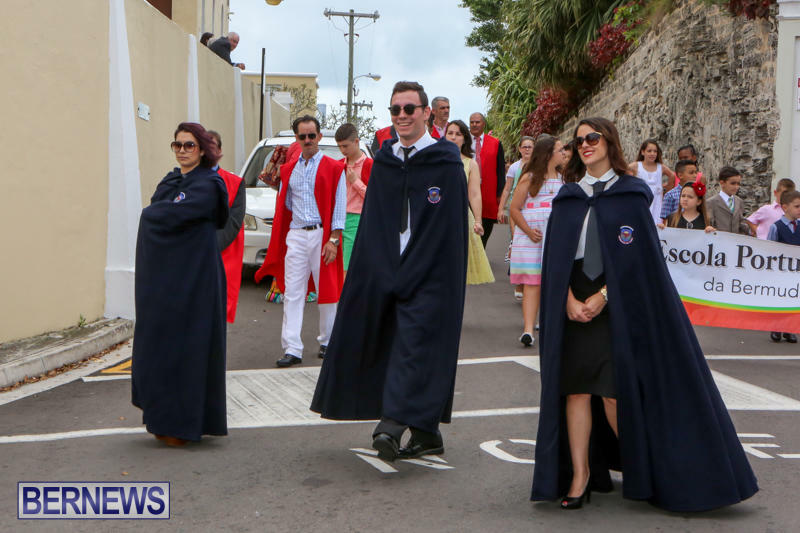 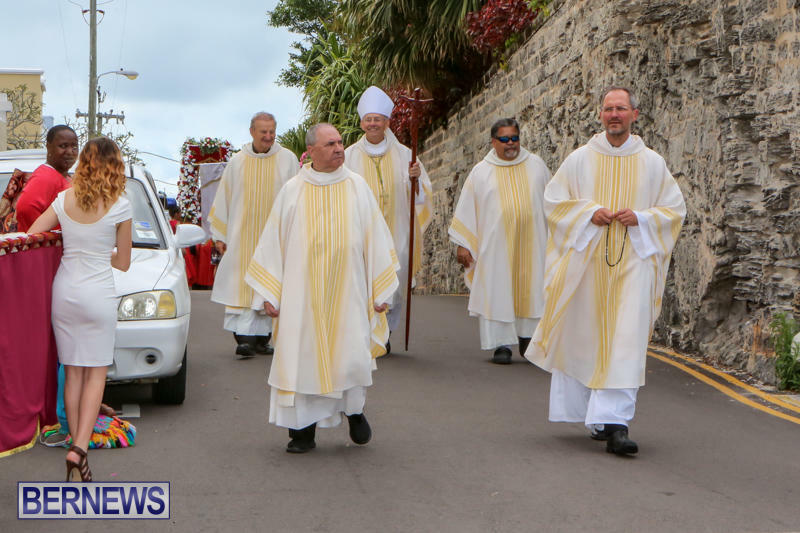 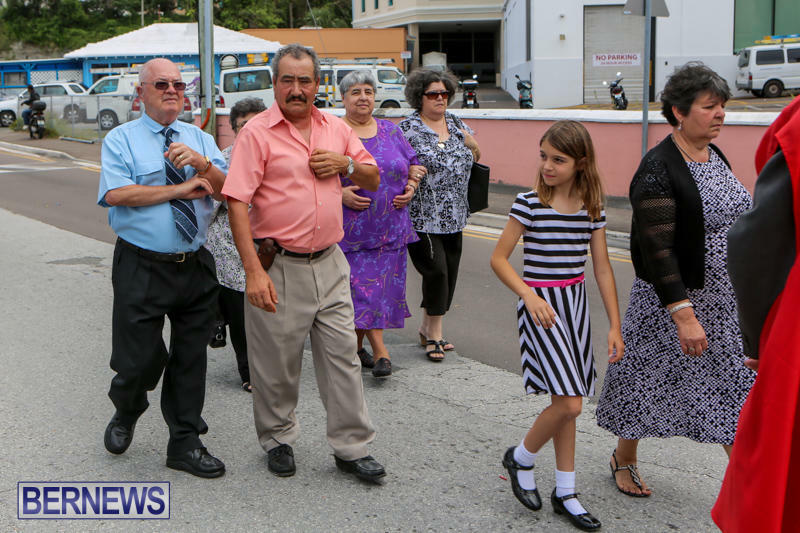 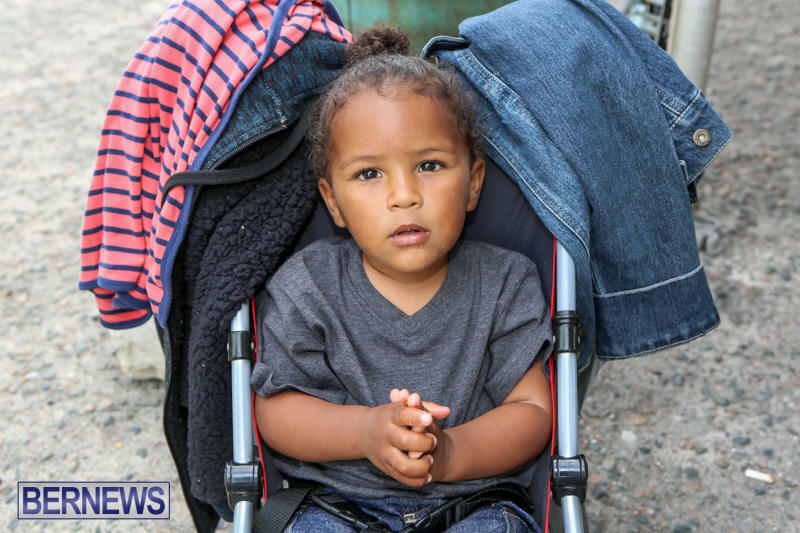 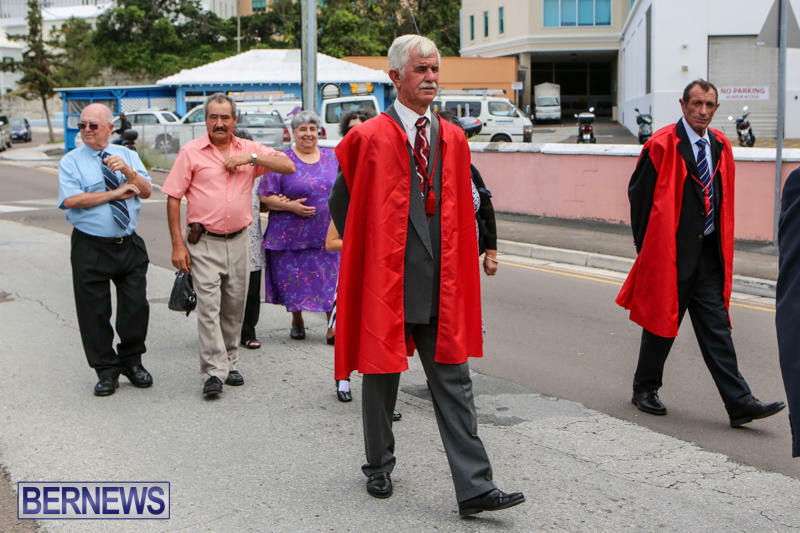 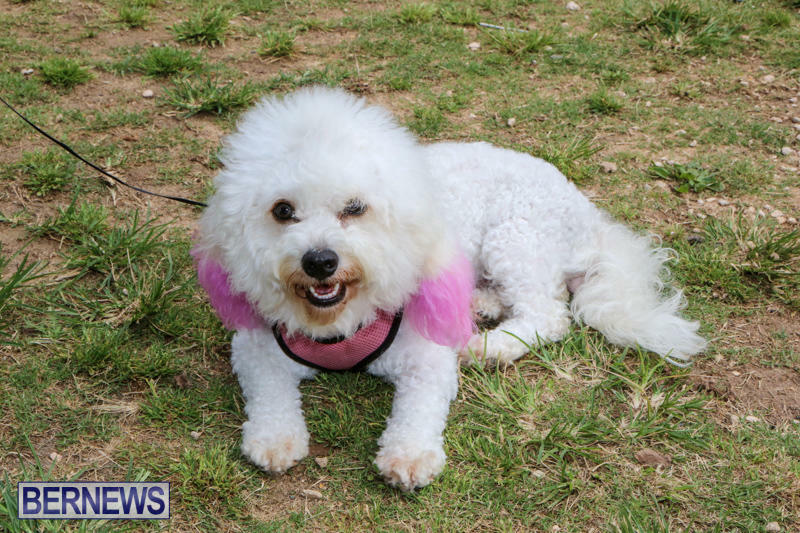 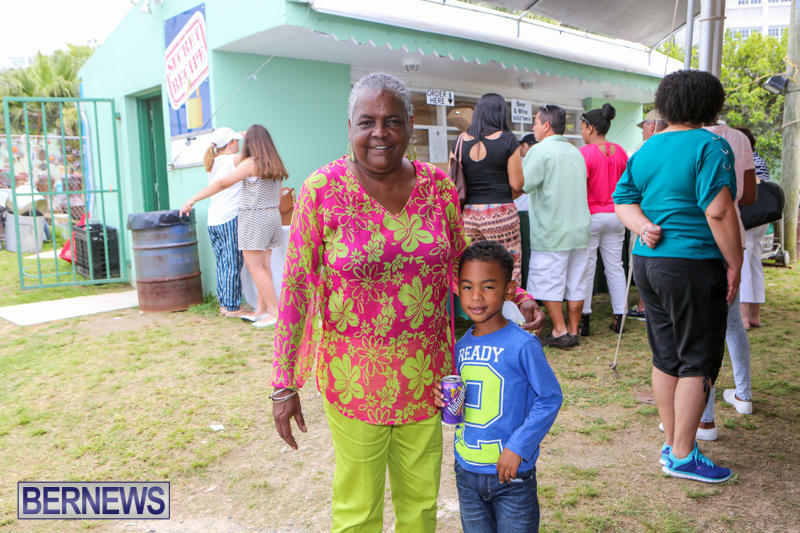 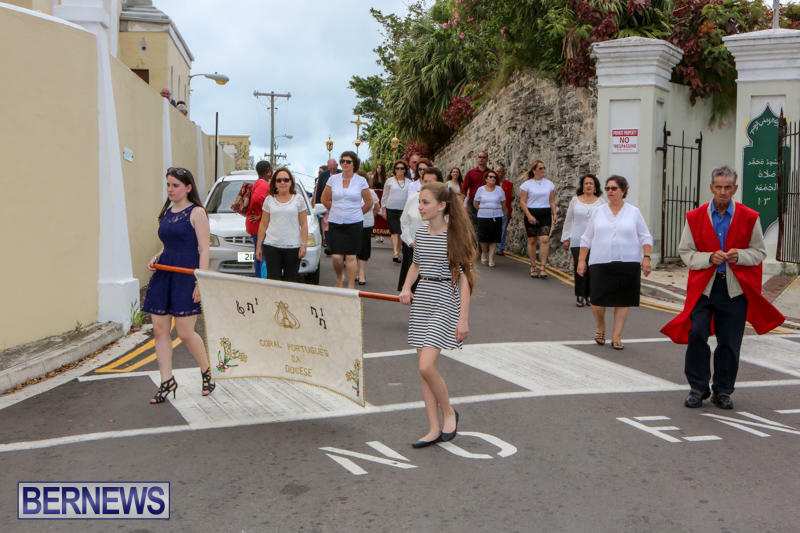 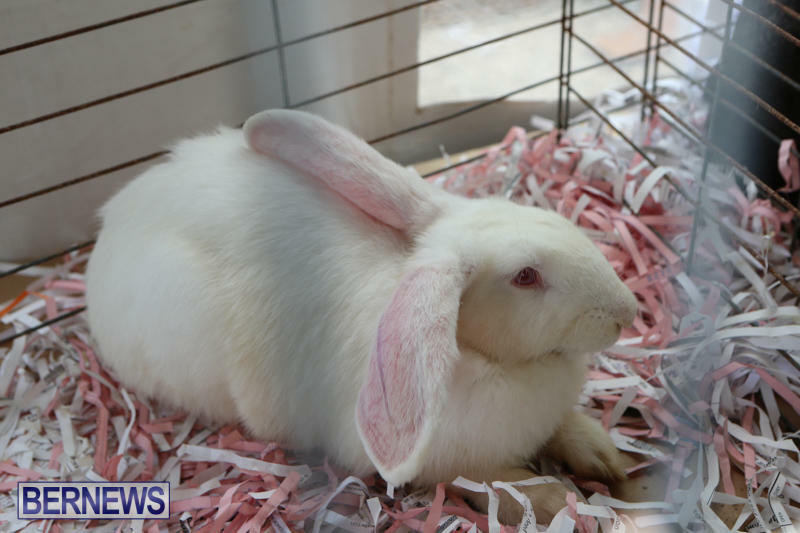 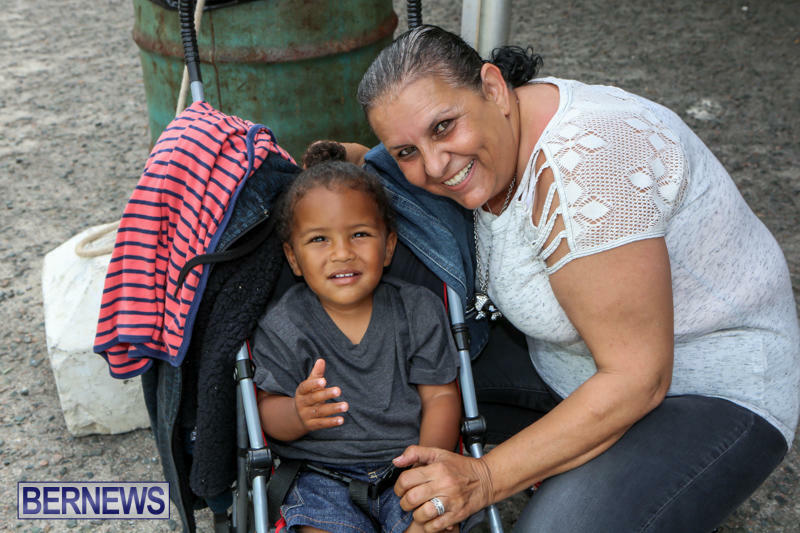 The procession continued on to Woodland Road passing BAA where a celebration would be held throughout the night with entertainment, refreshments and auctions to help raise funds for the church. 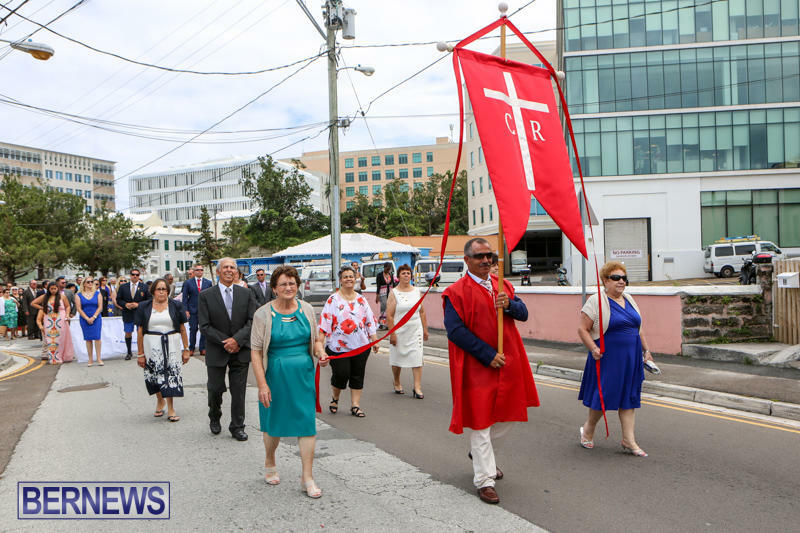 Turning on to Canal Road the group followed Laffan Street back to the front of the cathedral where clergy addressed the crowd and then attendees made their way to BAA. 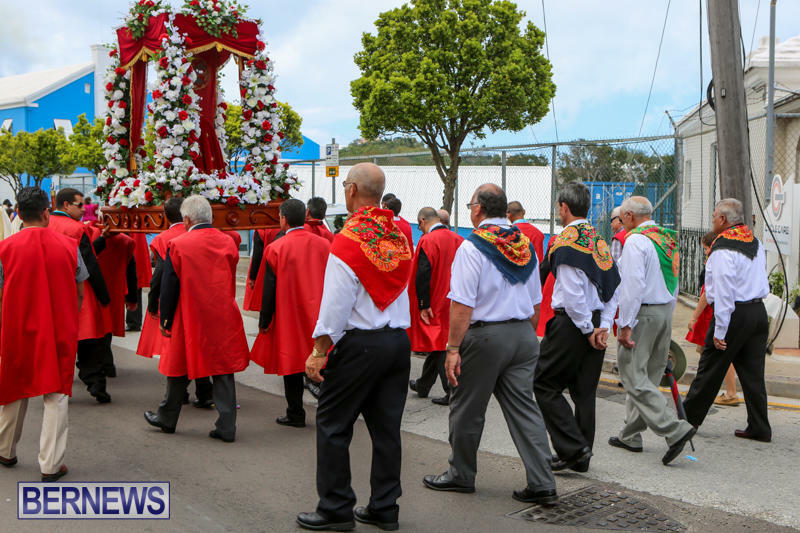 Some 400 years old, the Festival is the largest religious celebration of the Azores. 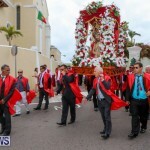 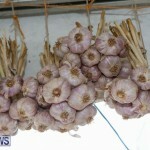 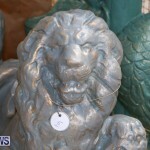 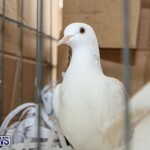 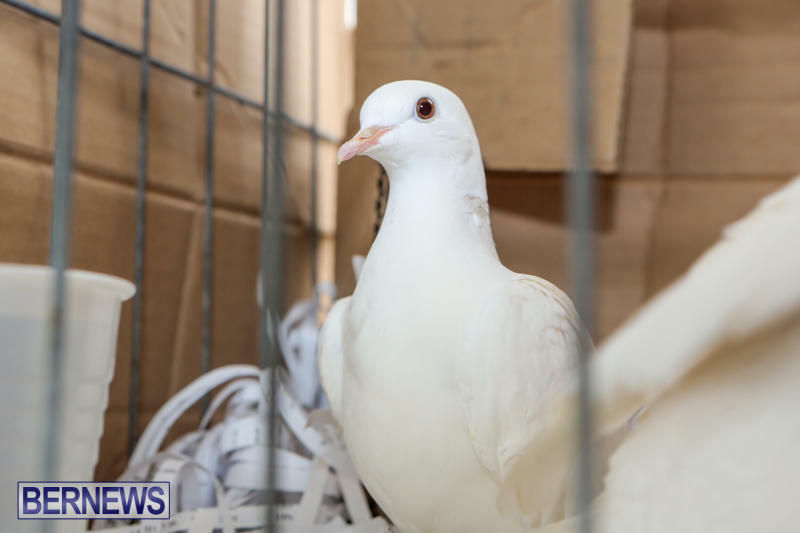 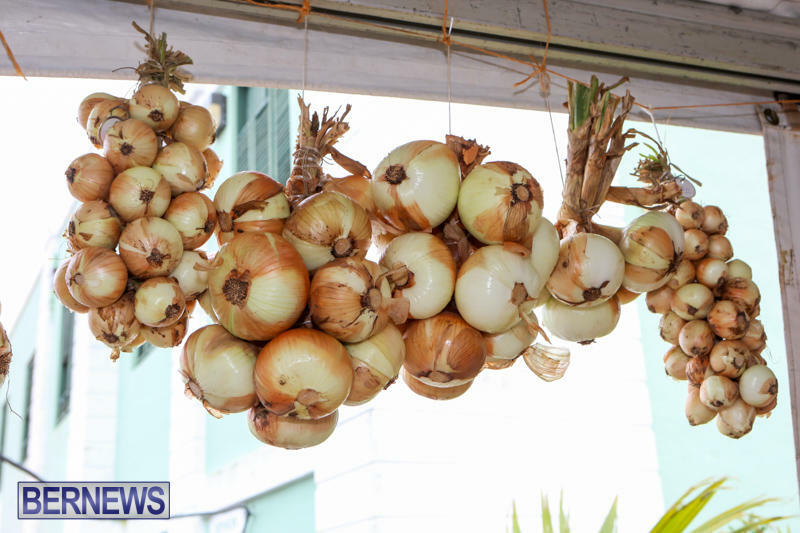 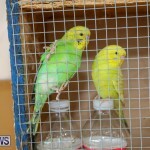 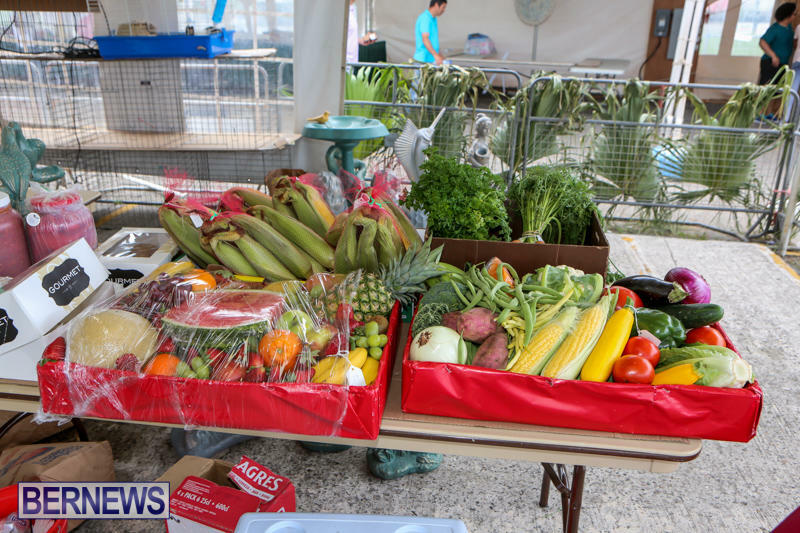 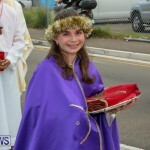 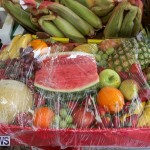 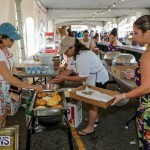 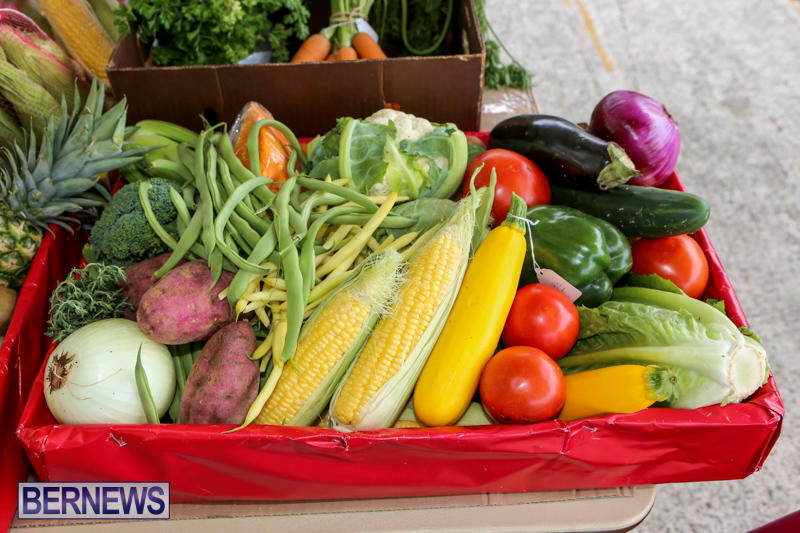 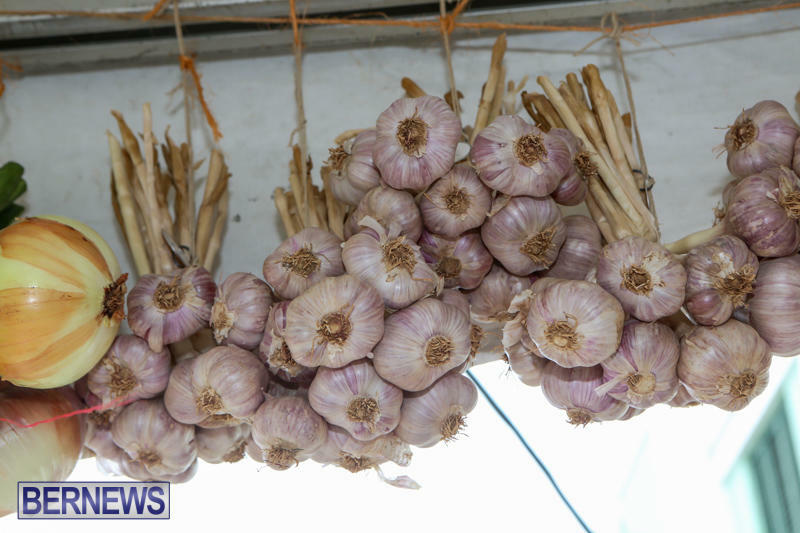 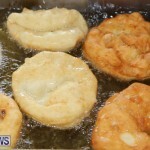 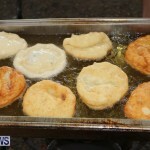 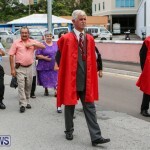 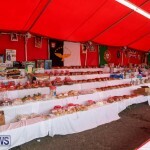 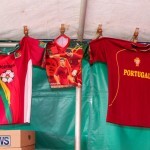 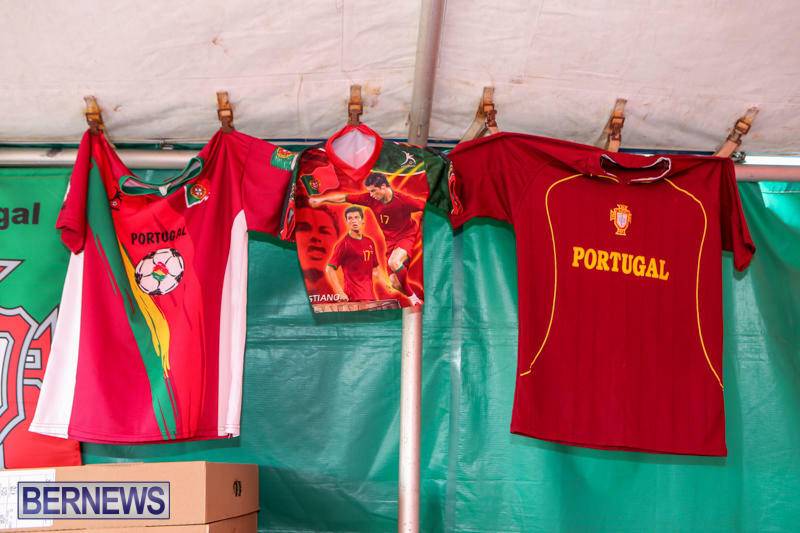 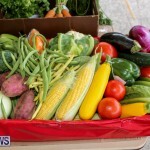 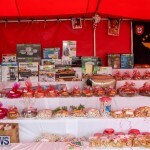 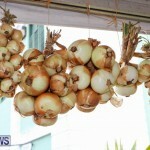 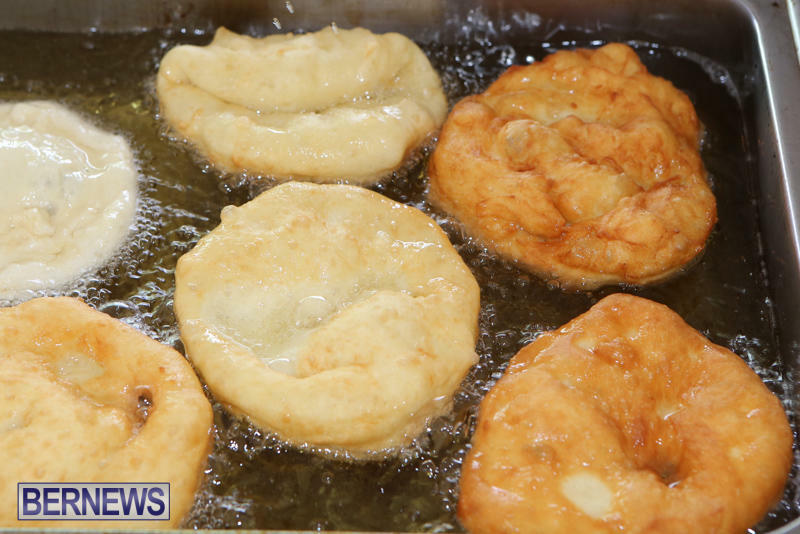 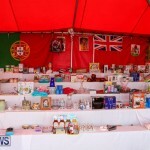 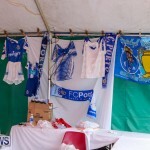 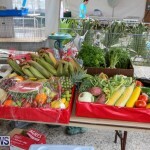 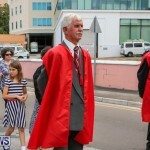 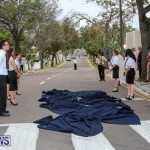 It was celebrated this same weekend in the Azores, as well as by members of the Portuguese diaspora across the globe.